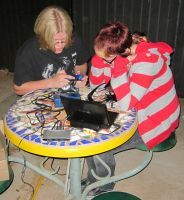 This is The Typewriter Repairmen's page for the 2010 National Underwater Robotics Challenge, a competition put on by Arizona Promoters of Applied Science in Education in Chandler, AZ. The Typewriter Repairmen is a family robotics club. Jim, the Principal Instigator, is a "retired" mechanical engineer. 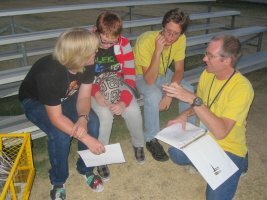 He has worked with the local FIRST high school robotics team NERDS for the past four seasons as an engineering mentor, and discovered that it's about the most fun thing there is. Janet, his wife, has a Masters degree in Systems Engineering, and works at Ft. Huachuca. 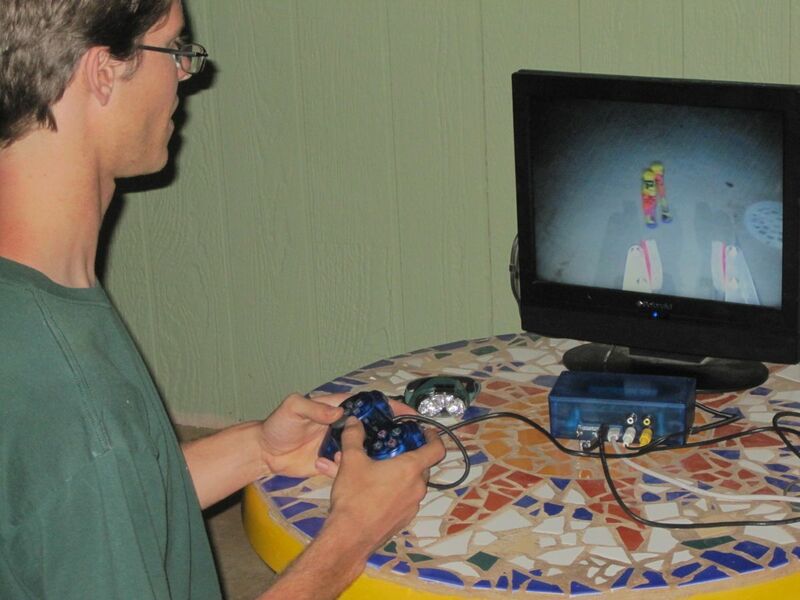 Jim's brother David is an Electrical Engineer at the University of Arizona's Steward Observatory, and also runs a side business Cathode Corner, which sells neat electronic gadgets. 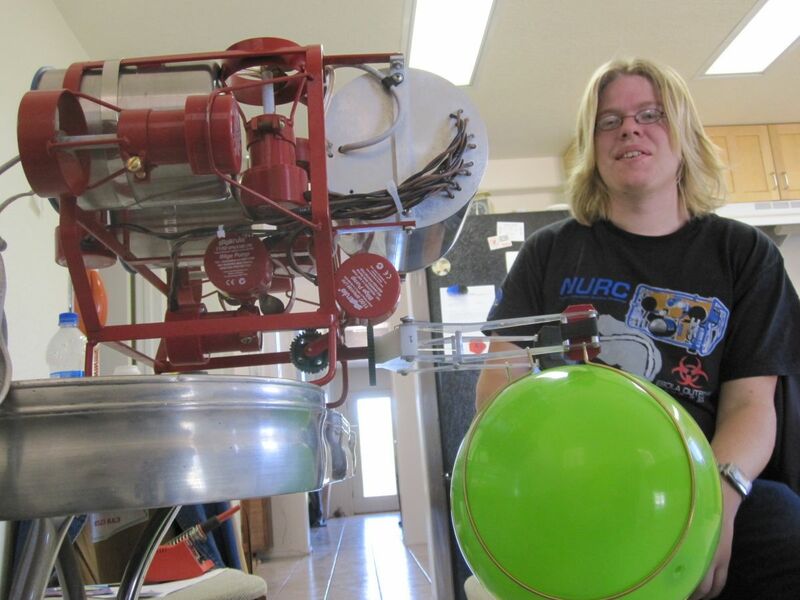 Jim and Janet's son Steve, who is nuts about robots, is also a mechanical engineer. All through the project we have been posting videos on youtube. Happy Birthday, Gary and Kevin! The competition is over (all but the awards banquet), and we had a great time. Friday we spent some time getting to know the other teams and looking at their robots, and engaging in nerdspeak. We did a little bit of practicing with Babs in the shallow end of the pool, and then went to the deep end to qualify. The Site 3 team had just made their third qualifying run, finising in an astounding 32 seconds. We made our first run, at 43 seconds. Steve tried again, and ran slower, 49 seconds. We decided to quit while we were ahead. The next closest qualifying was Freebird, at 56 seconds. We found out that if we left the torpedos in the pool, and they separated from the radio tag (payload tube), we would have to retreive them. If they did not separate, we could leave them as is. We discussed it and decided it would be best to disable the reversing feature, so the torpedos would stick and just stay together. David figured out what part to remove from the control boards, and made the modification (he brought his microscope and soldering iron). Late in the day, we attended the ice cream social, and brought out Babs to play in the pool to show the visitors. 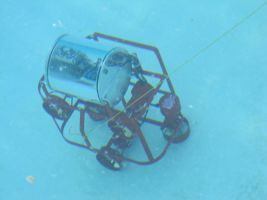 This was a lot of fun...we got one of the Carl Hayden students to drive Babs, and Steve operated their ROV Amanda. We even caught a little bit of video. We needed to discharge the batteries pretty far, so we could have them measured. Saturday was competition day. We didn't really have anything to do to the ROV, but we did spend a bit of time playing with the torpedos, fine tuning them by adding a small amount of weight after testing the balance. We charged the batteries all day, and gave our presentation. 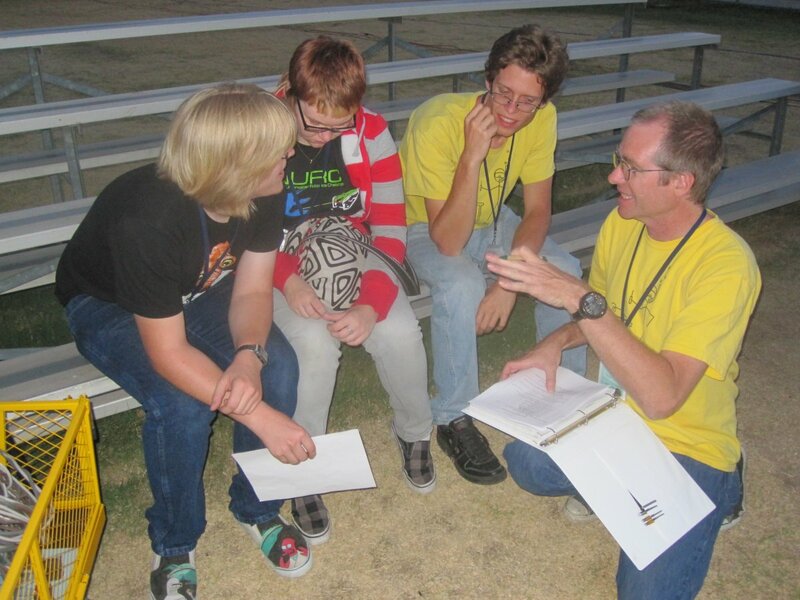 After all the teams had finished qualifying, the teams got together with the lead judge, and selected mission times. There were 21 teams signed up, 18 showed up, and 11 qualified. We were qualified second. Site 3 picked their mission time first, they picked to run at the very end (2:40am). We selected the first slot, so we could get it over with, and also to let the other teams see how the game works (there is live video in the viewing room). Our mission went very well, we finished all the tasks with just a few minutes to spare. We had plenty of excitement with the radio tag task...first torpedo went high. Second torpedo went high. Third torpedo misfired, but Steve caught it! and brought to the surface so I could reload it. Then, it hit the mark, and we heard Nessie scream. The Typewriter Repairman would like to thank APASE for putting on the NURC, and we'd like to thank all the volunteers to worked so hard to make it happen. The event went off very well, the last mission was about one minute late starting (compared to the schedule), which was amazing! Fantastic job, and the game itself was very well designed, and very fun to play. Steve and I finished the introduction video. It was fun to make, and turned out OK, we think. I also made a short video describing the solar charging system. The test session at Dan's house was fun, we did lots of torpedo playing with the new laser guidance system. The laser beam works surprisingly well, and confirmed that if Steve centers the camera with a specific technique, it will always end up looking at the correct height. 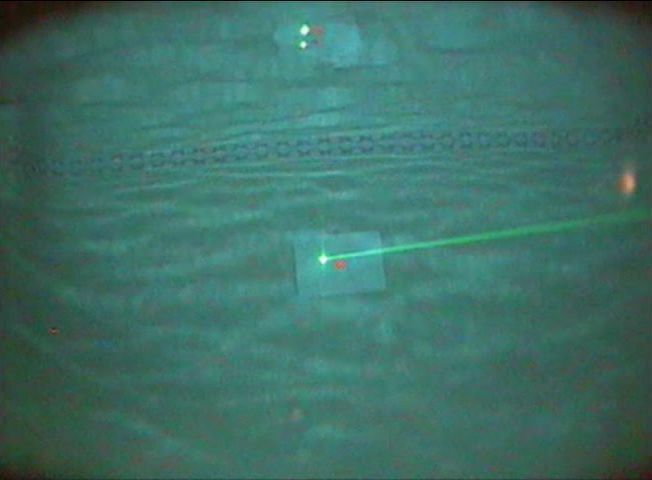 So even if the laser is deemed unsafe to use (it presents a slight danger to the divers in the pool), it was worth installing just to get that information. Oh, and the value added to the intro video is a big bonus. We did a bit more work on the torpedoes, trying to make sure they release the payload. We modified the bayonet latches a bit, and added holes at the rear of the payload tube, to allow water to enter more easily. We're packing stuff and getting ready to go. David was going to make some extra circuit boards for the ROVotron, but ended up going to the mountain yesterday to work, and won't get home till later tonight...so maybe he'll demonstrate soldering surface mount components Friday, for all to see. It's getting close! This is Tuesday, and the competition starts Friday. I think we're mostly ready. We are working on the intro video, as usual it takes way too long, because we think of fun things to film, so we have to go to all kinds of trouble to set up the shots. The neighbor's pool is getting a bit murky, so Babs can't see very far. Tonight we're heading over to another friend's house to play, hopefully they will be adequately entertained, and we can get some driving practice, and make sure things are working right. Babs has a laser now! We decided to just go ahead and install the laser in the SCULL, so we can work on torpedo aiming. If we're not allowed to use it at the competition, that's ok, but it would be neat if we could. While we were in there mounting the laser, we also rewired the 5V power system, adding a separate voltage regulator, run off the auxiliary 12v supply, to power just the servo (oh, and the laser). This will hopefully fix the issue with the depth gage going nuts when the camera is moved. We also replaced the huge capacitor for the torpedo launcher with a smaller huge capacitor, so it looks a bit better in there. 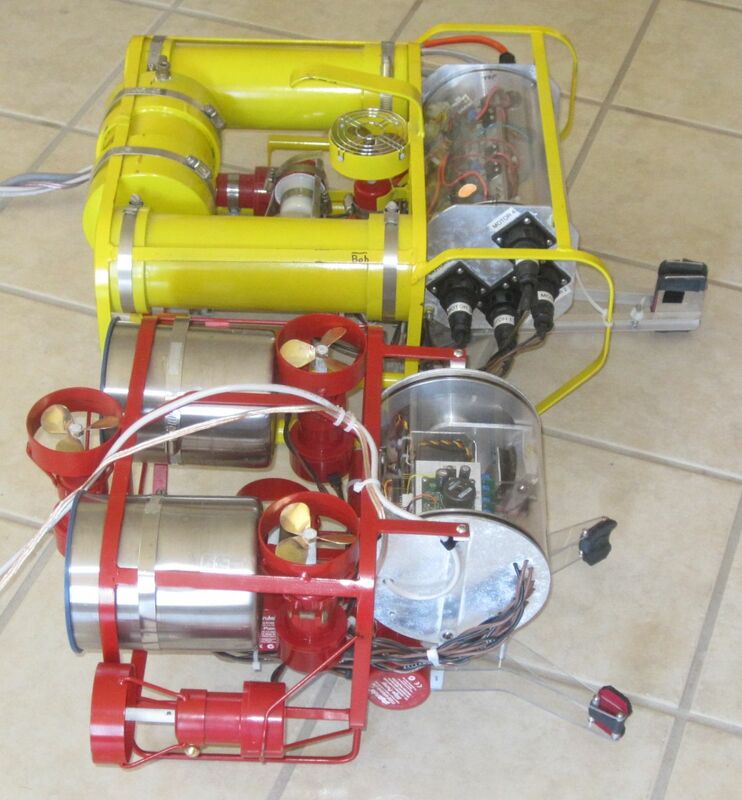 The other two torpedos are done, and they seem to work ok, although they could use more balancing work. They seem to both be a bit light in the nose. The technical report is done, you can find it at the "Technical Documents" link above. Last night, we took Babs to a Candlelighter's camp for families with children who have cancer. David's son Linus had lukemia when he was young. The kids enjoyed the demonstration of Babs swimming around and shooting her torpedo, and I saw the glint of potential engineers in a few young eyes. 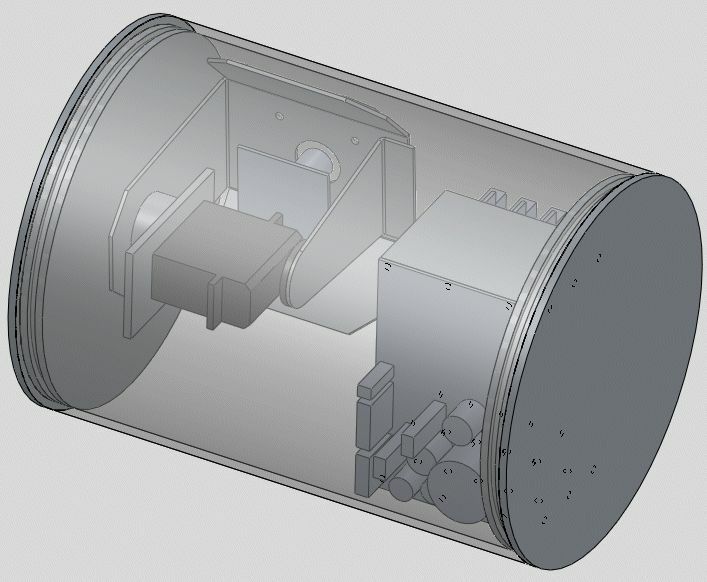 We are satisfied with the design of the torpedo, so Steve is modeling it in SolidWorks, so we can have dimensioned drawings to use to make more parts. We want to have three torpedos, in case we miss the first shot or two. Besides, they're very fun to play with in the pool. We have also been thinking about the aiming problem. Steve has put a marker on the monitor, indicating where the torpedo is most likely to hit. There are several variables, including how straight the torpedo flies, how the camera is pointed relative to the torpedo launcher, etc. To make the aiming more accurate, we have had the idea for a long time to use a laser pointer. 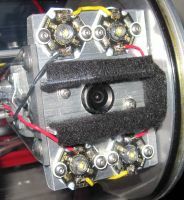 The laser would be aligned to coincide with the most likely path of the torpedo, so the driver would point the laser at the center of the target, and then launch. There are safety concerns because of the divers in the pool, and we also don't know if this would upset Nessie too much. But we can use the laser to calibrate the mark on the monitor, and to check the repeatability of the camera aiming technique. We are working on the power supply and mounting setup for the laser pointer. We disassembled the laser pointer to make it more compact, replace the switch with one of the relays on the ROVotron control system, and to get power from the ROVotron instead of the batteries it originally used. We've been reading the tech reports of the other teams, to see what interesting ideas they've come up with. 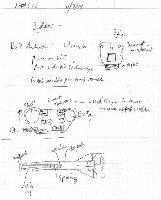 One that did not make it to a tech report, but was on a web page, is the ASU Space Grant team's torpedo--using rubber band power! I was really hoping that someone would try this, as it seems to be the best way to make it simple, cheap, and effective. Getting the balance and buoyancy right will be tricky, and making the launcher will be challenging, but it should be worth the effort. Not much robot work getting done, because the technical report is due tomorrow. 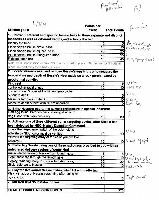 But the technical report is coming along nicely, it's available for download on the technical documents page. We still need to clean it up, the formatting is not even started yet, but most of the content and images are there. We did play with the torpedo some more. 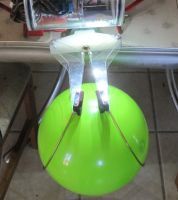 The glow sticks seem to have differnt buoyancy depending on which brand they are, so we figured out a way to make the payload adjustable, by adding some "washers" made of 19mm diameter foam rod. Steve has been working on aiming accuracy, and it's getting close...but accuracy at long range is a problem. I guess it's time to make that neat video guidance system. That should only take a couple years...hopefully Nessie won't be too far away from the launch gate! David is planning to drop off two more torpedo control boards this weekend, so I need to get to work making the rest of the torpedo parts. Looks like we'll need all three, based on statistical experience from tonights test session. We finally got the torpedo to be launched by Babs, hit a target, leave the tag stuck to the target, and drive off the payload. Video of the torpedo doing it's thing underwater. Getting there took a lot of work. 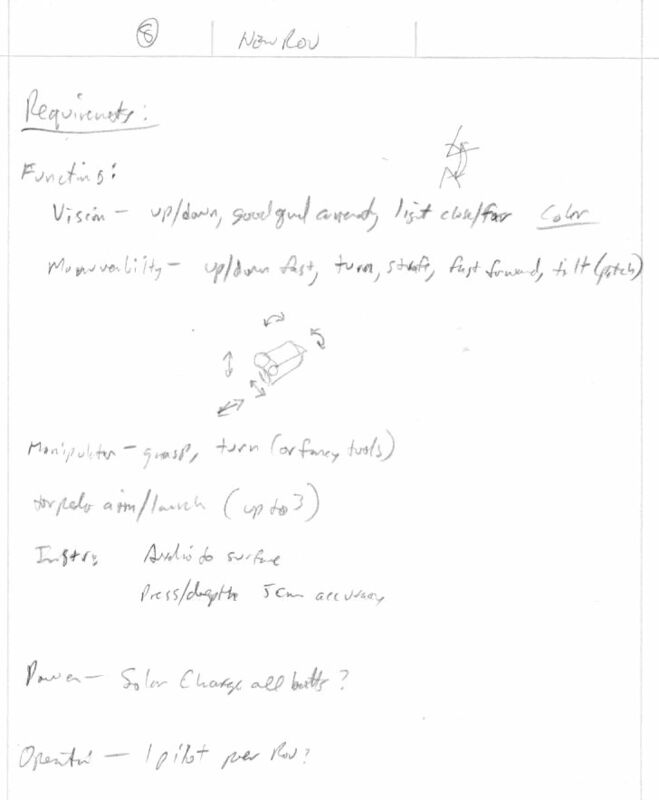 The original concept dates back to last November (scroll down to the bottom of this page), but it took this long to figure out all the details. 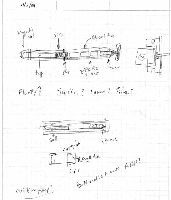 We decided to use the sprinkler valve solenoid, with a brass pin screwed into it's slug, which fits into a hole in the rear of the torpedo. 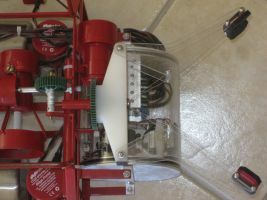 The spring in the launcher pushes the torpedo forward after the pin is retracted by the solenoid. As the torpedo moves forward, it's reed switch passes a magnet, and activates the torpedo's motor in the forward direction, and the torpedo drives to the target. If it hits steel, the strong magnet at the front of the payload tube sticks to the target, and the reversing switch is activated by the momentum of the battery acting on it. 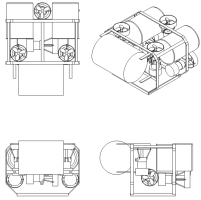 The motor reverses, the torpedo's body rotates the opposite direction, disengaging the bayonet lock between the payload and torpedo nose. The reverse thrust drives the torpedo body off the payload tube, runs for about a second and a half, and stops. The positively buoyant torpedo floats to the surface, for recovery. Rube Goldberg would be proud. We've been playing with the torpedo more. The new circuit board worked ok, but not entirely right. 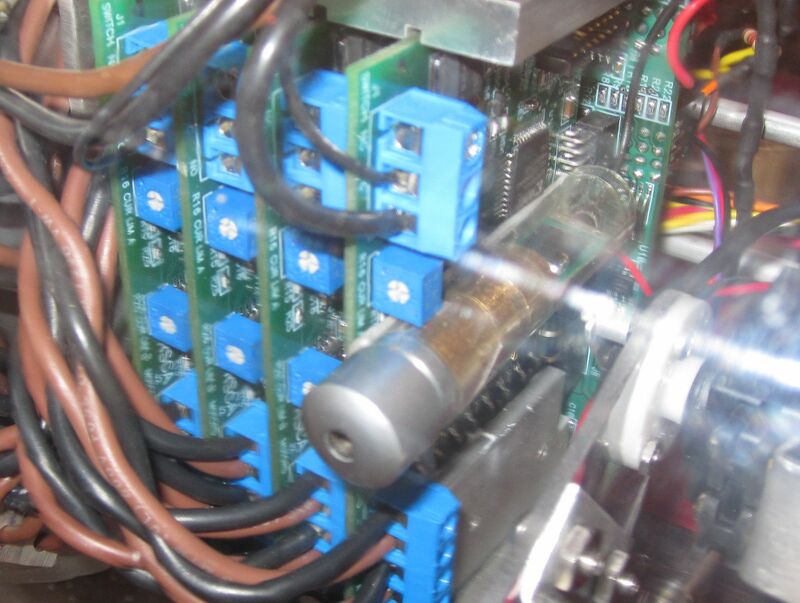 It took us a while to figure out that the debounce circuitry for the reverse switch had too long of a time constant--it would only work if the torpedo had a long, soft "hit", not a sudden hit like it usually has when striking a metal plate. A quick discussion with David resulted in us removing the capcitor in that circuit, and it works great now. 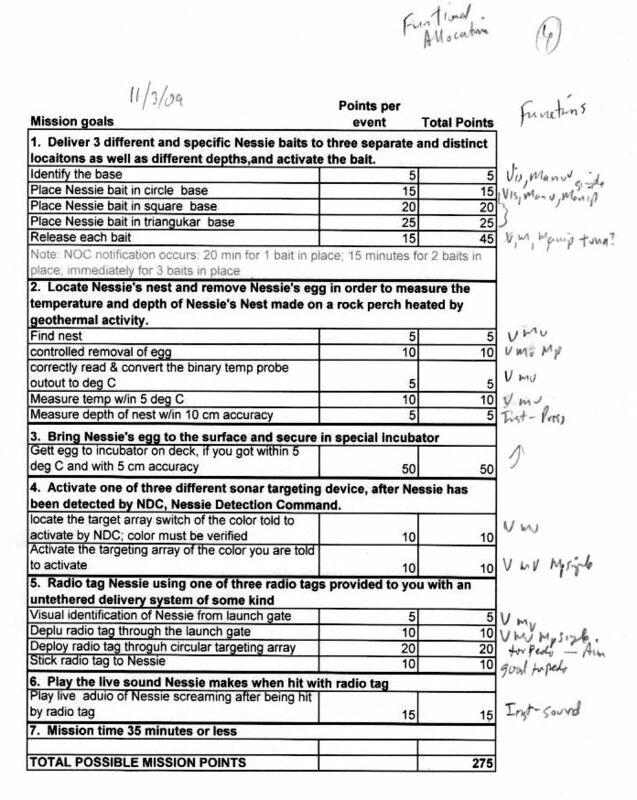 We also spent a lot of time figuring out how we're going to release the torpedo from the ROV. 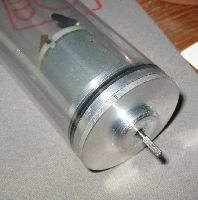 We considered having a lever retained by a solenoid and springing out past the magnet, having the torpedo just "stuck" in the tube and power itself out by activating it's reed switch with an electromagnet, various methods of using the claw to activate or release it, or having a direct pin release on the torpedo body. 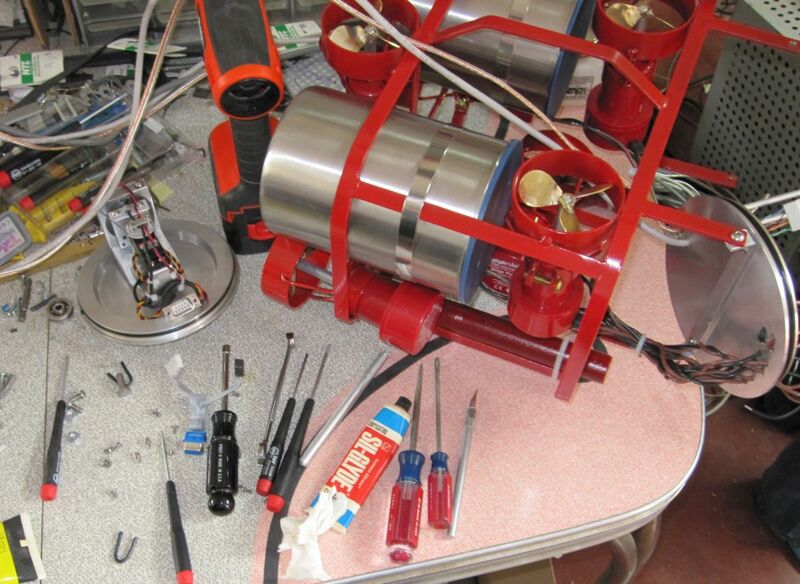 We decided to try the direct pin release using the sprinkler valve solenoid, and a spring behind the propeller. This looks like the easiest system to build and should work well. 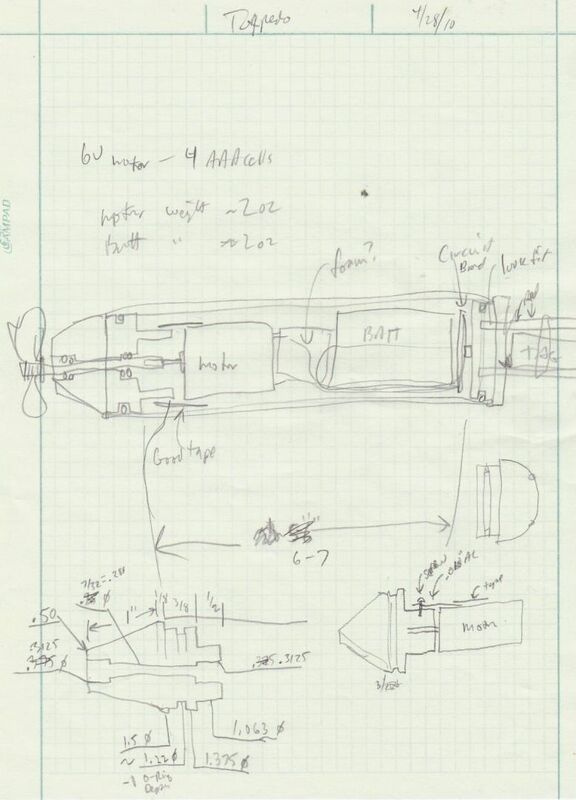 One problem was figuring out how to keep the payload tube in the torpedo before launch, but Steve realized that a bayonet type mount, which requires the torpedo to "unscrew" itself from the payload, would probably work. He added a pin to the nose cone, and cut some slots in the payload tube, and we tried it. It works so far. 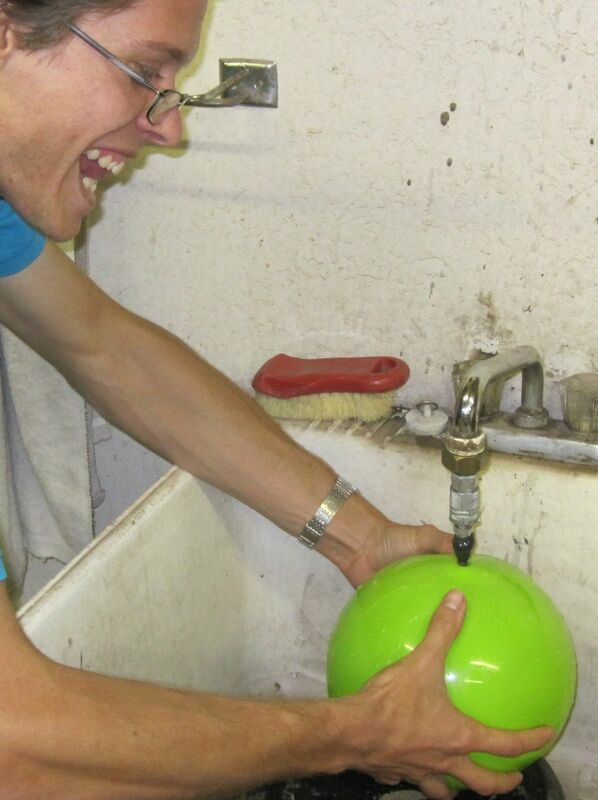 Kevin came up with a neat idea for how to attach the Nessie Egg holding hoops to the claw. He suggested notching the ends of them, so they could fit into holes. I kind of misunderstood his idea, and thought he meant to make grooves on the ends of the wire. We did some preliminary testing, and it looks like the idea will work. The practice session last night revealed that visibility with the aluminum claw is a problem. I painted two of the plates black, but while doing so I realized that we could make them of Lexan. So, I made four new plates that are clear plastic, and we put them on Babs. We plan to take her up to Tucson this evening, so David and Gary can see how the claw works. Steve and Kevin got to practice using the aluminum version quite a bit already. 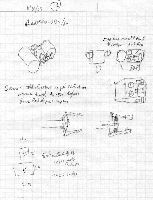 I added a few pictures of the claw mechanism, and comparing Babs to notBob. We figured out the programming problems, there is a comma missing in a configuration table, and the X and Y axes on the PS/2 pads are labeled the reverse of what we thought. Knowing this, everything works fine! We reconfigured the controller to have the driving stuff done with the joysticks, the camera all on the right pad, and the claw on the right trigger and left pad. Steve is much happy with how the controls are laid out, although he needs to practice driving more to get "natural" with it. We made a practice bait prop, as well as a platform to put it in. We decided to do the triangle, as it's the most difficult, as it can only be oriented one of three ways. 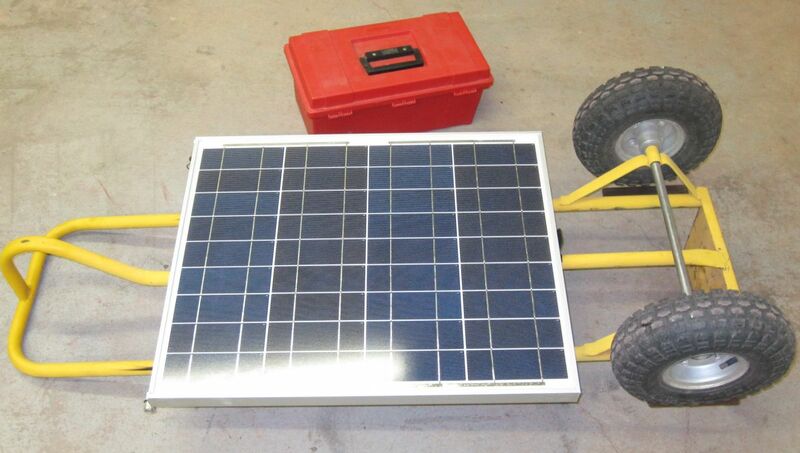 We did a bit of practicing during the day, then charged the batteries (the solar panel equipped cart is great!) and then spent another half hour after dark practicing. Steve is getting the hang of it...last try only took a bit over a minute. 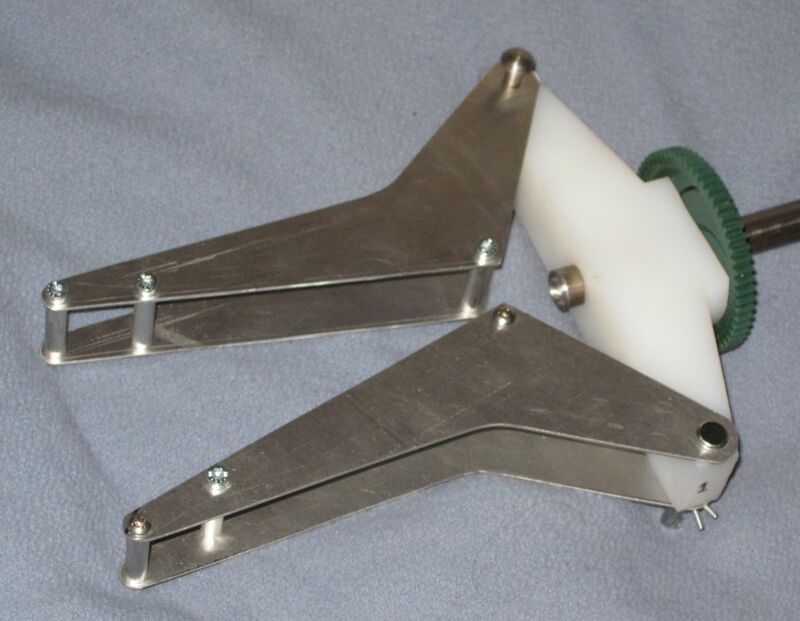 The claw design works pretty well, but we might see if we can come up with a better way to make the gripping end. We also noticed that the prop design is a big awkward, as the bait wants to flip over, so we used an aluminum handle, and added steel plates to the bottom of the wood to make it stay upright and be just slightly negatively buoyant. our wood is not as thick or as large as it is supposed to be, and we don't have the inside bait stuff and light stick, so it's an approximation. Still, it should work ok for practice. 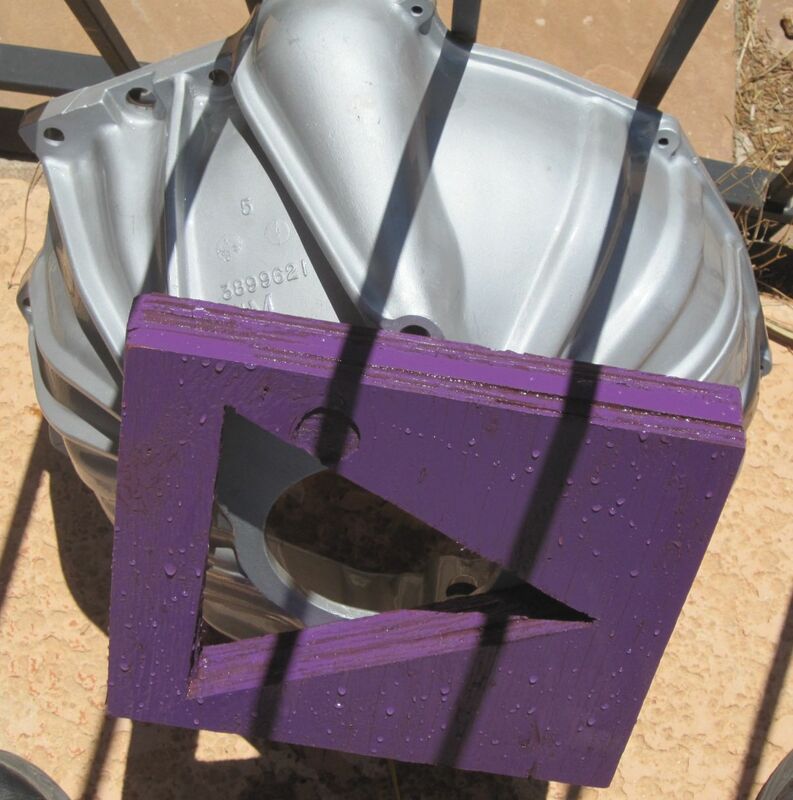 Be sure to look at the number on the bellhousing that the platform wood is attached to, search ebay and see what that old chunk of aluminum is worth. Steve and I got the claw done. It works well, although we need to change the control system a bit to make it more easy to use...and that means fixing a few minor bugs in the program. We might go to Tucson to visit David tomorrow, since he has the PIC programmer (and knows how to fix the program). When we added the two new motors for the claw, we also replaced the right forward motor, as it was leaking...turns out it did not have a shaft seal in it. None at all. Steve is a new graduate, time to find a job! But first we need to play with the robot. 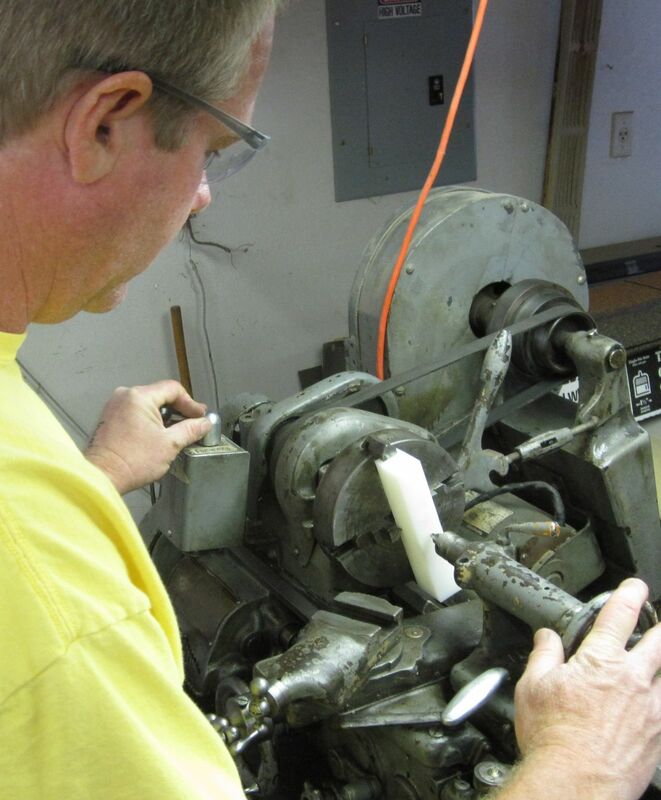 We started on the claw, the white plastic block holds the fingers, and will sit on a piece of 1/2" steel tube which will be welded to the bottom of Babs. The vEx gear is screwed to the block, and will be driven by a bilge pump motor with a worm gear on it. 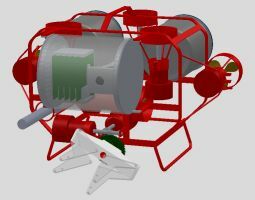 The claw will be actuated by a winch, with a similar motor/gear drive, pulling two pieces of fishing line, connected to the claw fingers. The fingers will be pulled apart by springs. Time flies, not much gets done. 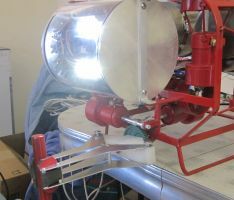 Steve has been really busy, but he should have time this weekend to work on refining the claw design, so we can start building it. 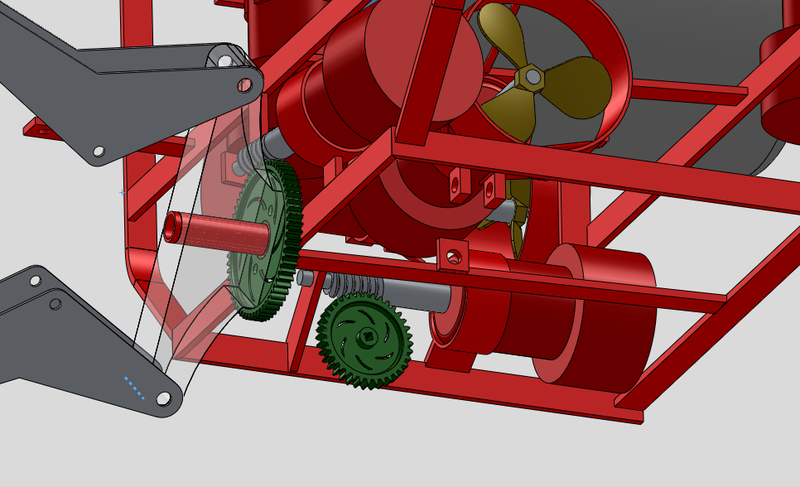 He did a rendering, but it does not show the winch shaft/spool. I tinkered with the torpedo some more. 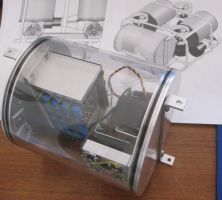 I designed a motor mount that seems to work well, it consists of a piece of thin polycarbonate tube, wrapped most of the way around the motor, and attached with strong mounting tape. 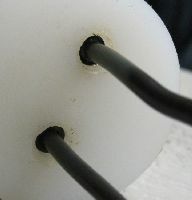 The other end is held to the rear plug using three screws. 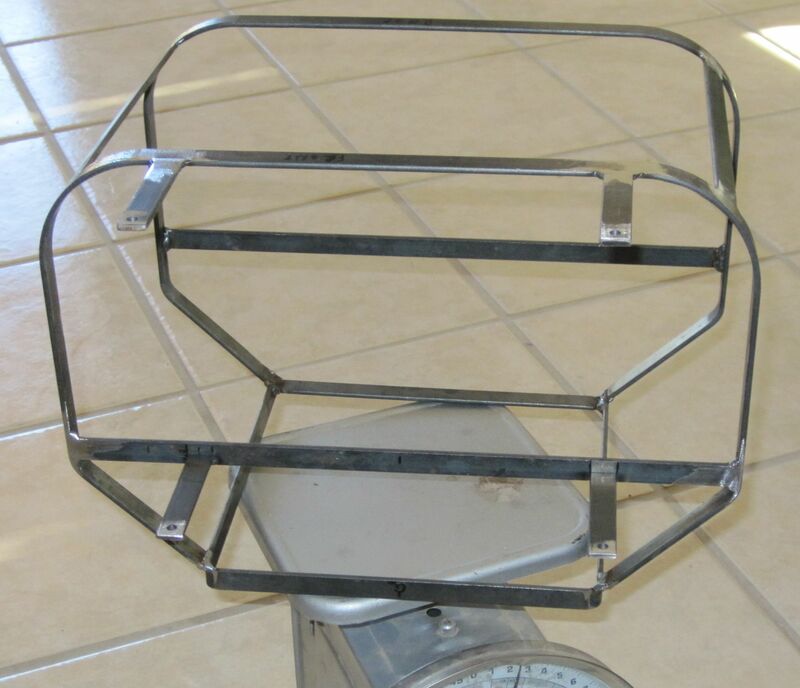 It allows a bit of movement in the sideways direction, but holds the motor from moving forwards or backwards. 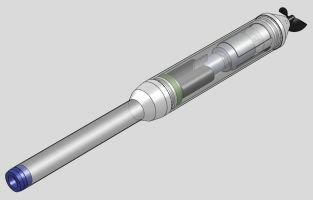 I also redesigned the shaft/prop connection, since the prop I had tapped out to 10-32 broke. I drilled the new prop with a clearance hole for a #6 screw, and drilled and tapped the end of the prop shaft for the screw, then filed flats on the end of the shaft so that it fit into the slot on the prop. I am using only one O ring to seal the shaft, it seems to work ok so far. 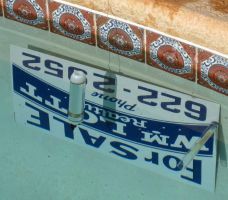 I have not done a long term soak at the bottom of the pool to test it, that's on the list of things to do. 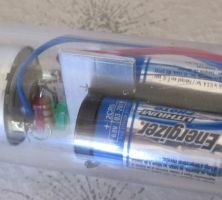 I decided to experiment with alternate batteries, as the alkalines don't really work well in high load/short duration applications. 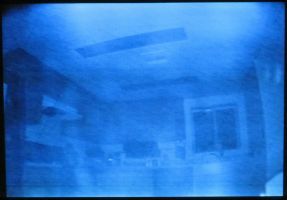 I got a 2CR5 6v Lithium camera battery, and put it in the torpedo. 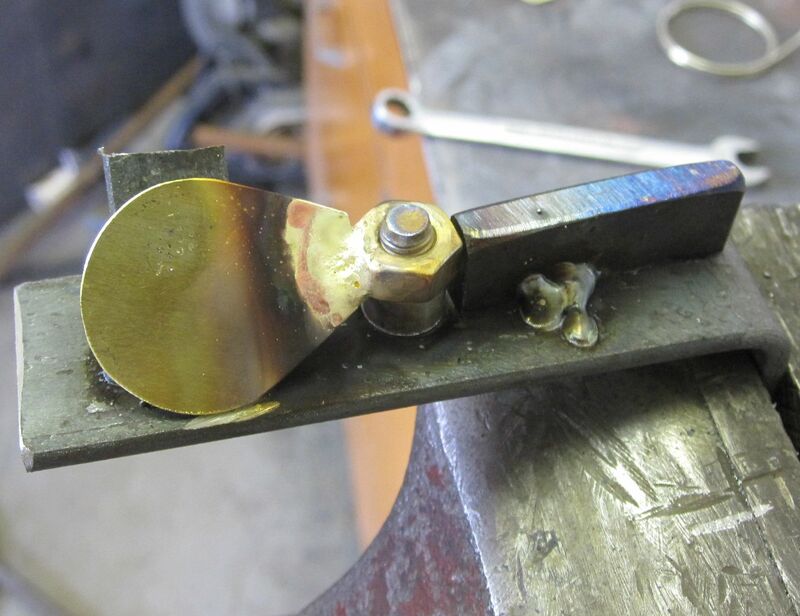 I also made a new radio tag holder, from a piece of thin plastic tubing that originally held brazing rod. I made an end piece for the front to hold a strong magnet, and a new front plug for the torpedo with a hole that accepts the tube as a loose fit. I had to do some balancing, the brass wire coiled around the torpedo body adds the seven grams it needed and allows the balance to be adjusted. 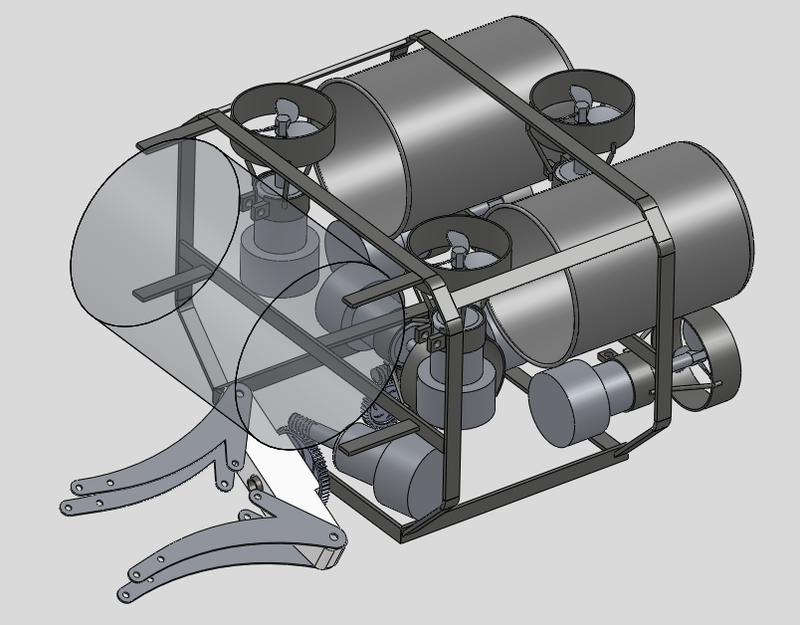 This will be done internally once we get the rest of the electronics/battery mount designed. 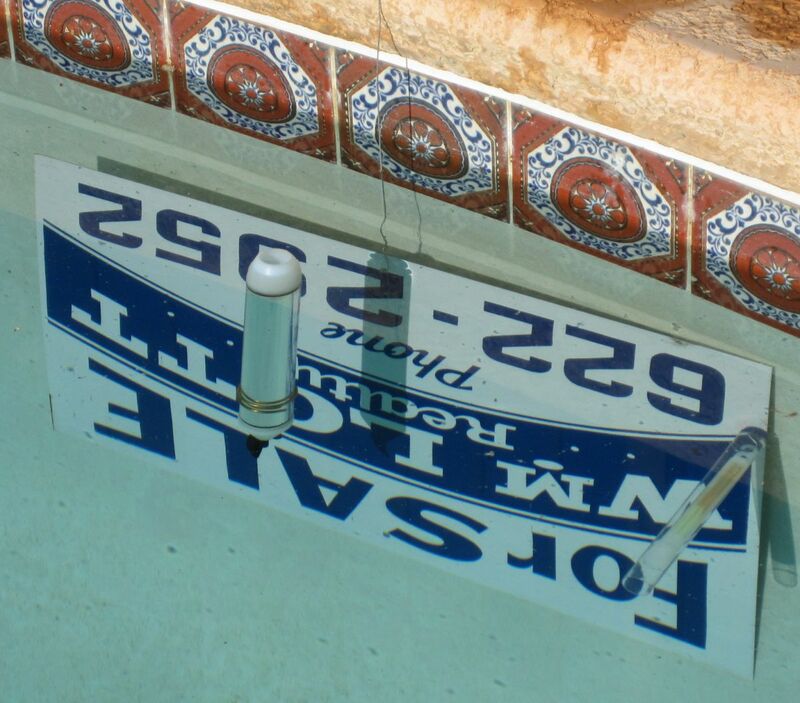 I got a steel realty sign and put it in the pool as a target. After a few tries, I actually hit the target with the torpedo (launching it by hand, using a magnet to turn on the reed switch), and it stuck, and the torpedo drove backwards off the tag, and then shut off and floated to the surface...just like it was designed to. It's almost May! 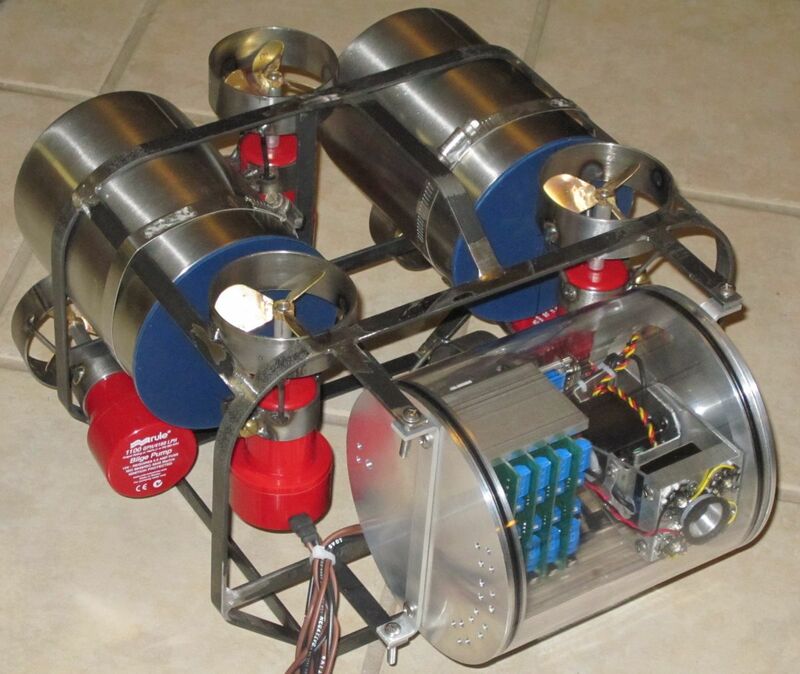 I didn't do much ROV work this week, but I did revisit the torpedo thing. 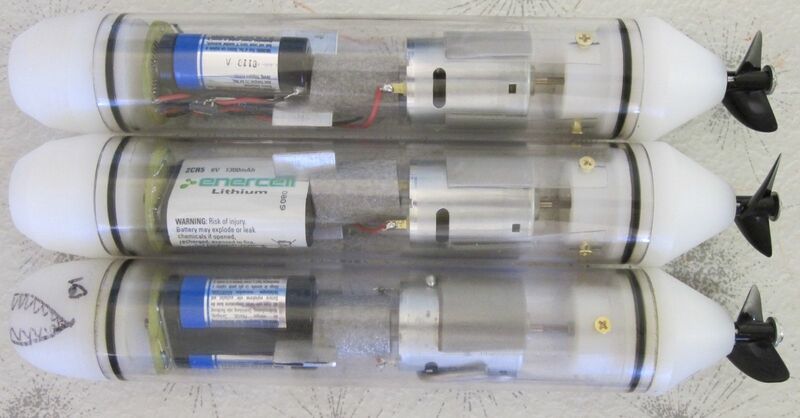 David ordered a few more motors, he found a few different flavors of 6v motors the same size, for a dollar a piece. 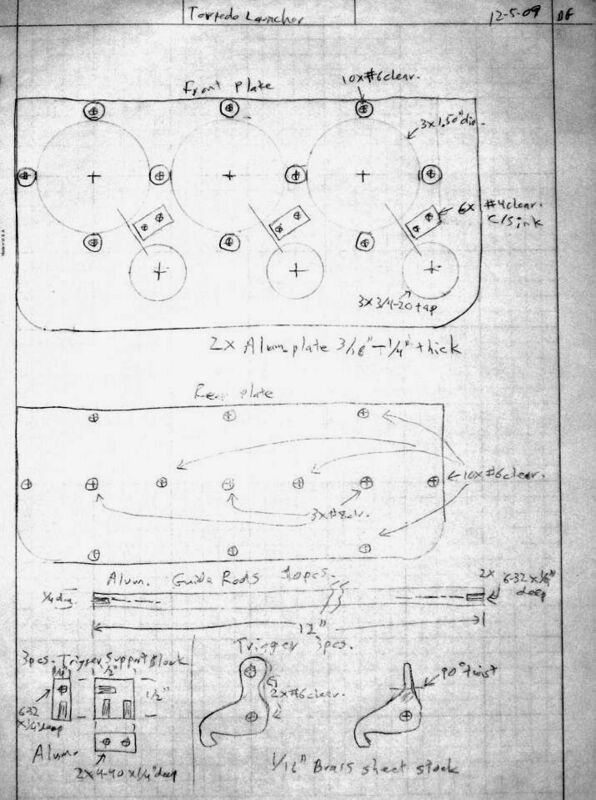 He also was planning to order the circuit boards to make the control systems for them. I did some work on the lathe, making some new parts to try out. First I did some design work, and realized that with the motor moved forward just a bit, and only using one battery pack, the torpedo could be a bit easier to balance, as well as shorter. 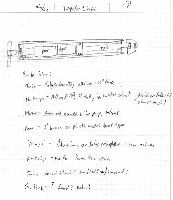 I also thought about the propeller shaft seal, and decided it would be worth trying to use O rings to seal it, as it only needs to work for a short time. 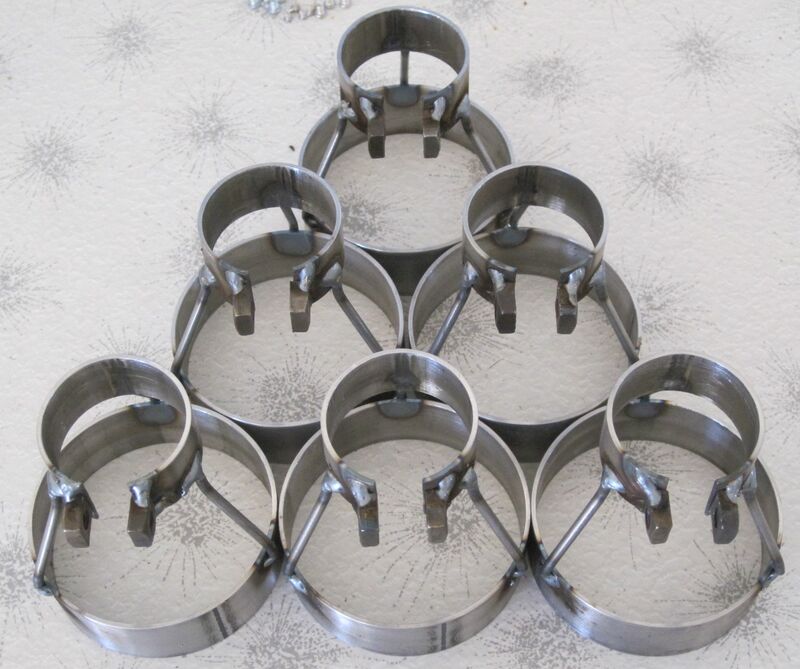 Using O rings also frees up the design, as they are available in many sizes, and are relatively easy to fit into different designs. We still have the problem of securing the motor to the rear end housing. I though of using tape, but it won't stick to the white plastic very well. I might try taping a thin aluminum sleeve to the motor, then using screws to attach that to the plastic. The alignment is an issue, but we can probably get away with a sort of loose mount, and rely on the shaft to keep things where they belong. We're making progress now. Kevin and Katie drove Babs around for a while Saturday night, using the myvu glasses. The glare is all gone, there's only electronic interfernce to worry about now. This morning, I "skeletenized" Babs, removing the electronics and motors in about five minutes. No wires need to be disconnected to do this. I then played with the forward thruster mounting, first trying it with them pointed up at the front, which didn't really help, then moving them out, forward, and up a few inches, which did help. She now drives mostly level, just a slight kick up in front when starting out. I was thinking more about the cart, and I think it might be best to get a four wheeled garden cart. I found them at Lowe's for $85, but did not buy one yet. David suggested trying to do a loop with Babs, which I attempted, but I was too far from the pool to watch which way she was going, and it's hard to tell what's going on using the onboard camera. 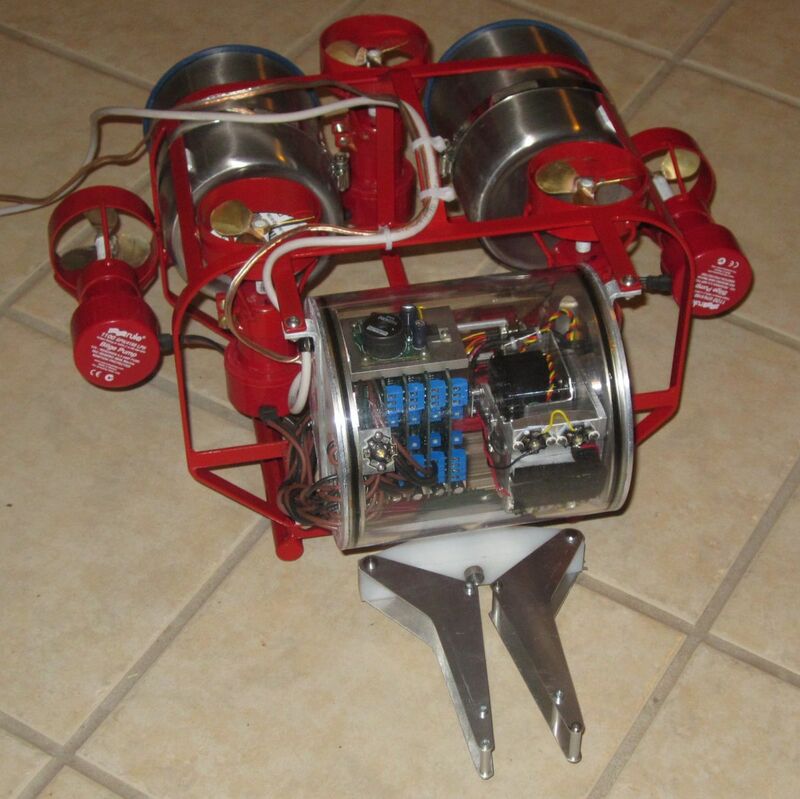 I guess we can work on developing our ROV aerobatics skills? 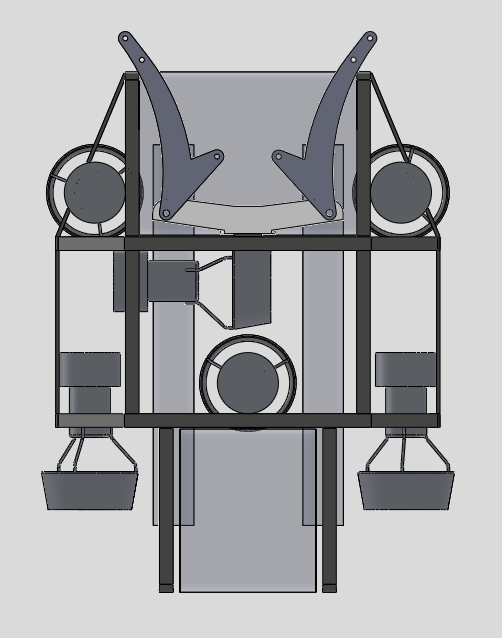 Gary suggested going to four thrusters for forward/side/turning motion, with a vectored setup. Just so we can drive faster forward, than up/down. 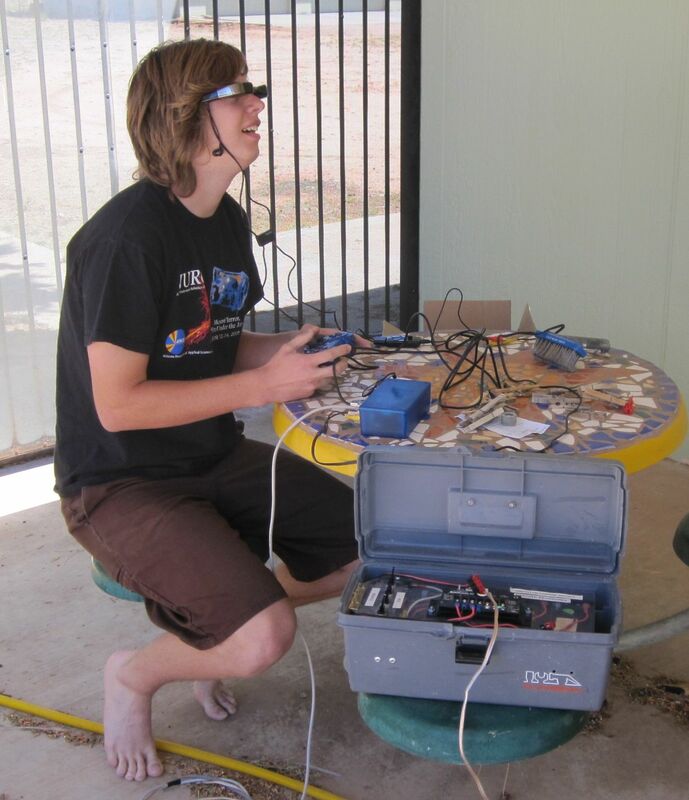 David got the analog inputs on the ROV working. 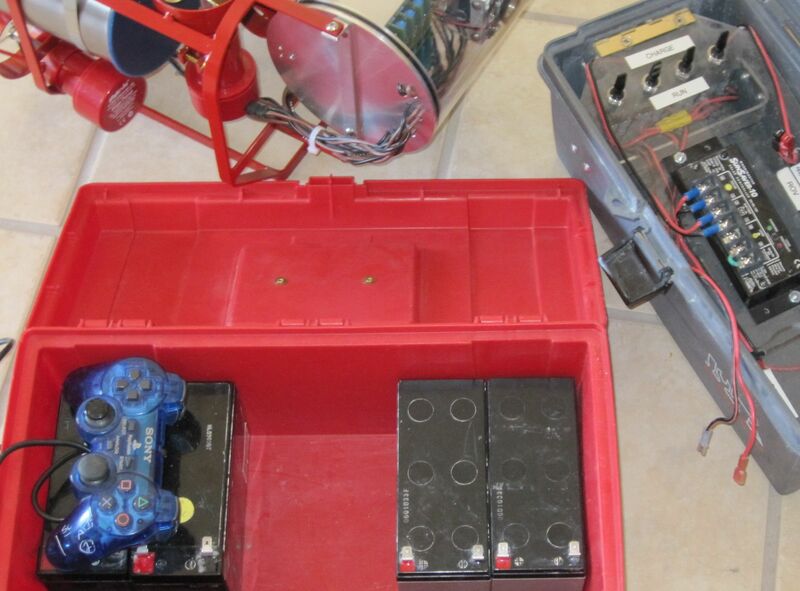 It now displays battery voltage and depth on the ROVotron transmitter (the blue box). But the camera died...I got to troubleshoot it, apparently the reciever chip in the blue box died while he was doing some rather vigorous testing to make sure the software would not cause problems. I was able to bypass the bad chip and get one of the video outputs working, so I could test the modified LED mount. That LED mount does seem to work better, as it gives more room for shades to keep the light out of the camera. I tried it first with just the aluminum channel as a shade, but it was not too good, so I added some felt after talking about it with Steve (on the phone). He suggested adding a wide strip across each edge of the channel, which I did. It still leaked light in the end where it was reflecting off the end plate, so I added some felt across the end. I cheated and attached it with double sticky carpet tape. I did take Babs over to the neighbors' pool for a spin....now we know why I'm not the driver! But I did get a little bit of simulation practice using the very beginnings of Kevin's simulator game program he's working on. 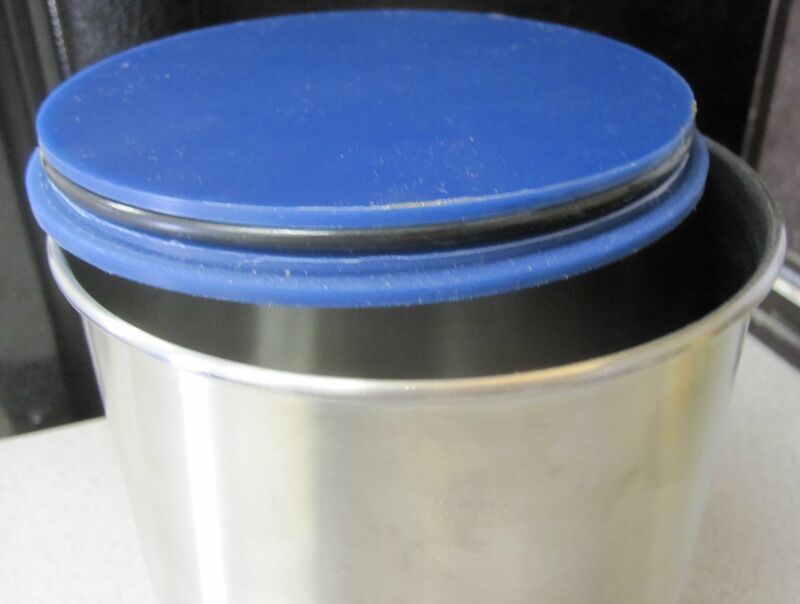 I also bought another kitchen canister to make a shorter floaty. 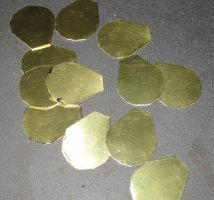 I used tin snips to cut it about an inch shorter, then sanded the edge smooth. It works! I removed a pound of steel from one side of the bottom of Babs, and she sits about level and is mostly buoyant. And my new myvu glasses arrived in the mail! They have 640 x 480 resolution, and seem to work all right. I have not tested them after fixing the glare problem, but I think they might be useable for practice sessions, and maybe even the competition. They sure are easier to carry around than a 15" TV. David said he had some programming to do, concerning making the analog inputs work, including enabling two way communication on the tether. I worked on making a more portable "green charging" station. Last year we used a 75 Watt solar panel that David already had. I decided to buy a new 40 Watt panel, because it's easier to handle, and should provide sufficient power to recharge the batteries in several hours on a summer day. The panel cost about $75, so it was not a great expenditure. 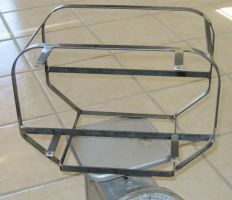 It is as wide as the wheels on a typical two wheel hand truck, and short enough to fit between the wheels and the handle. I changed the wiring to work with our existing battery system, and made a hinged mount for the panel on the back of an old hand truck. It should work well just laying the whole thing down during the middle of the day, and we can add a brace to prop the panel up at an angle for early or late in the day charging, or for use in non-summer seasons. 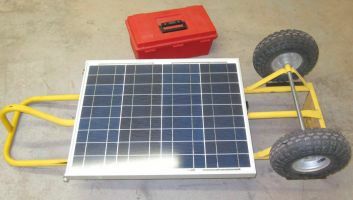 In addition to holding the solar panel, the cart will also hold the batteries and control system in the red toolbox, and the ROV and tether above it. I'll probably also make a fixture to hold a 19" TV to use as our video monitor. David sent some pictures of Babs as she sits right now. And I finished building the revised LED mount plate. 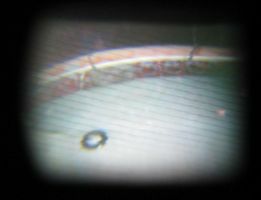 David reports: "Steven, Linus and I took Babs for her second spin in the Moellers' pool, this time at night with the camera and lights working. We started at about 8:08 PM and ran until 8:48 PM. Battery pack voltage was 50.8V before and 50.2V after. Not much drain! That's from 12.7V down to 12.55V per 12V battery. 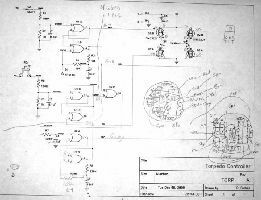 Note that the motor current limits are all set to 5 amperes, which is half of their rated current, so we can make her run faster with a screwdriver." "The pitching problem is still there when starting forward motion. We added a vertical drag plate 5" x 8" to the bottom of the front, mounted vertically with two steel clothespins, to see if it would eliminate the pitching on startup. It did reduce the pitching substantially, so the claw's drag may give some relief. We'd still like to investigate mounting the forward thrusters on the outside of the frame alongside the flotation tanks to move the thrust line closer to the center of drag." "The camera works quite well. The color is good, the resolution is very good, the lights illuminate stuff up to 30 feet away dimly. There is a significant glare problem in the corners due to the LEDs reflecting on the Lexan. 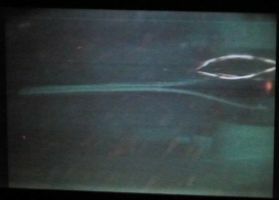 We need to repair this by making an LED plate that's one inch taller, with horizontal baffles between the LEDs and lens. All told, a successful run. Before this run, I added a cable clamp to the Cat5 tether cable and replaced the steel nuts on the SCULL brackets with stainless nuts. I also put one stainless socket cap screw in a thruster clamp to see how it looks. It looks good." 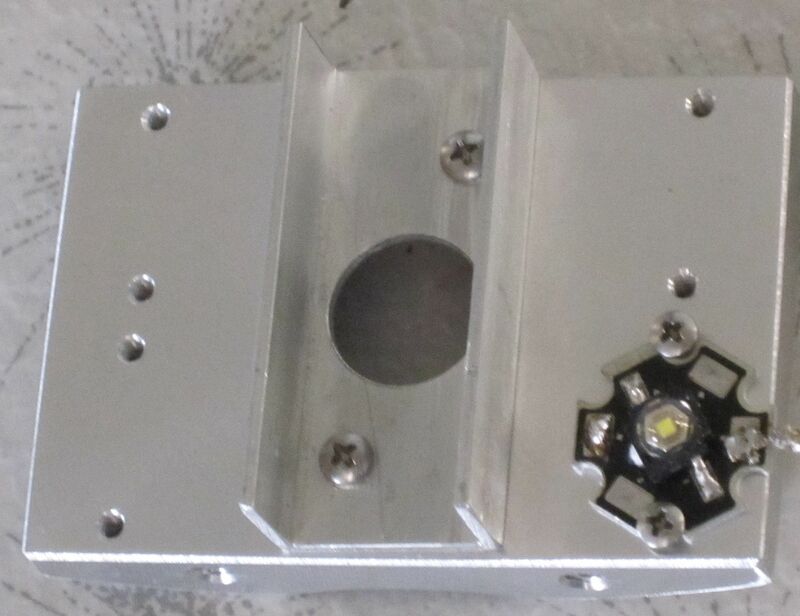 And Jim says....I designed a revised LED mount plate, it is an inch longer. It's partly made. 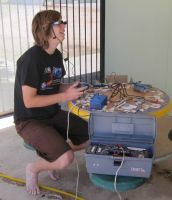 David reports: I was able to solve the various electronics problems in Babs today. The weak 12V power supply was fixed by adding the 12V power supply section of an ESC4A board left over from last year (dissected with a Moto-Tool) to the top of the card cage. It looks almost like it's supposed to be there. 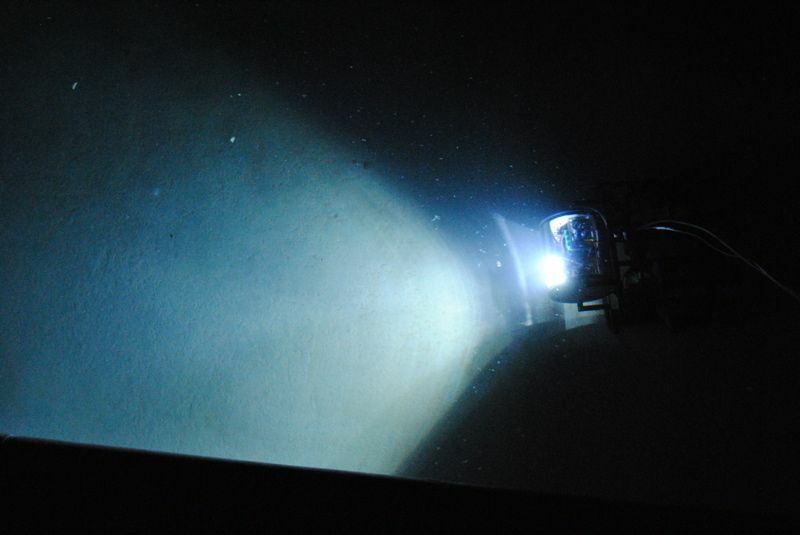 The LEDs were suffering from having 50V between the chip and the metal substrate. I ended up insulating them with silicone rubber pads and nylon shoulder washers. This requirement is mentioned in the data sheet, but they didn't seem to mind having 10V on them last year, so we got complacent. 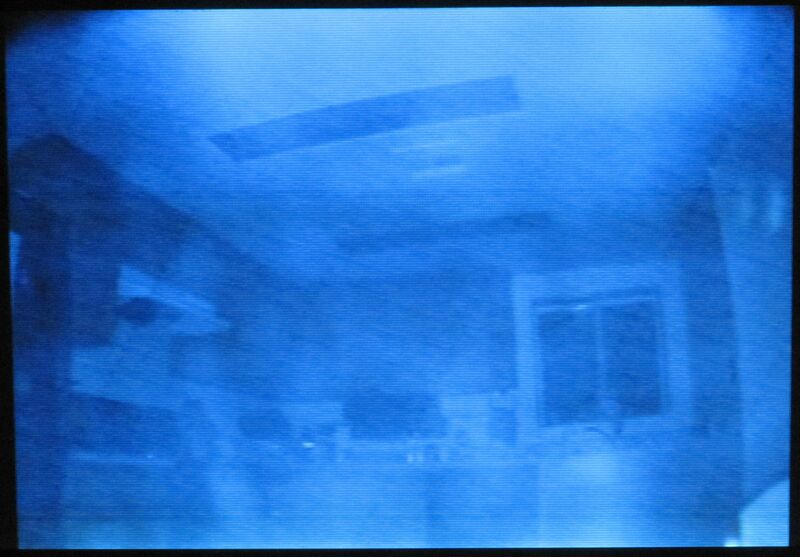 I adjusted the camera parameters a bit - I increased the brightness and decreased the contrast. That helped the color a lot. The camera suffers from Lexan reflections in the corners. 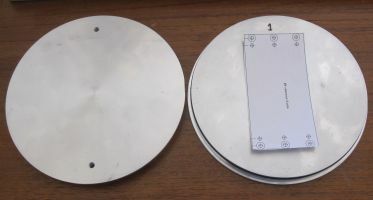 We can solve this most thoroughly by making a taller LED plate and adding metal light shields to it. The current LED plate is too small to add the proper baffling. I solved the motors-always-spinning problem by adding a dead band to the joystick reading code. It won't get up to 100% speed right now, but that can be dealt with later with a little change to the math. Yesterday we wired up Babs and took her for her first drive (in a Prius, and in a pool). 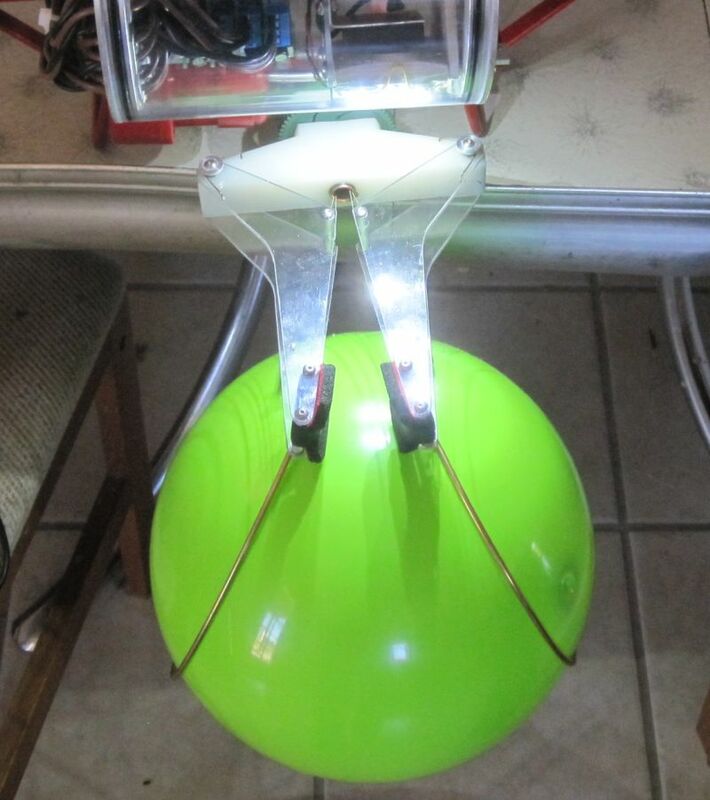 The ROVotron control system mostly works, although the LED power supply was acting up. David will spend some time this week figuring out what's wrong with it. Also the servo power supply needs more than a capacitor to make it drive the servo without loading down the camera power supply. Babs drives really fast, and is very maneuverable. The only driving issue is the relatively low placement of the forward thrusters, which makes her kick up her nose on acceleration. Steve wants to wait until the claw is on to see if the added drag down low will affect how she reacts. But he's really impressed with the up/down speed, and the tilting forward and backwards by driving the front and rear vertical thrusters in opposite directions, which is a feature we plan to use to aim the torpedo. The ability to reconfigure controls using the ROVotron's configuration menu is really neat, as changes can be made in a matter of seconds. I did paint Babs' frame red. That was easy. We'd like to have all the control and battery stuff in one box, and it would be nice if the display monitor would also fit in there, but that's not likely with a full size TV. 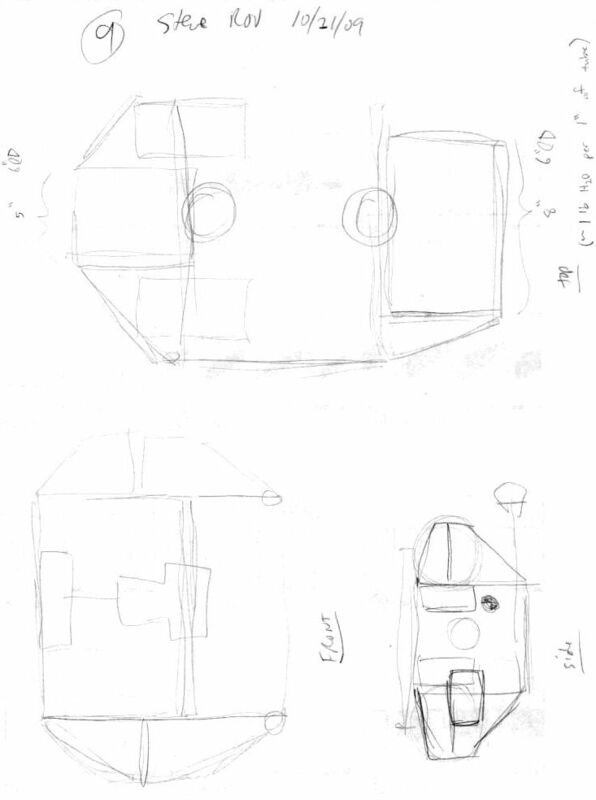 So, I am planning out a slightly larger tool box to hold the batteries, charge controller, ROVotron transmitter, PS/2 controller, and a small display such as a portable DVD player or tiny TV. 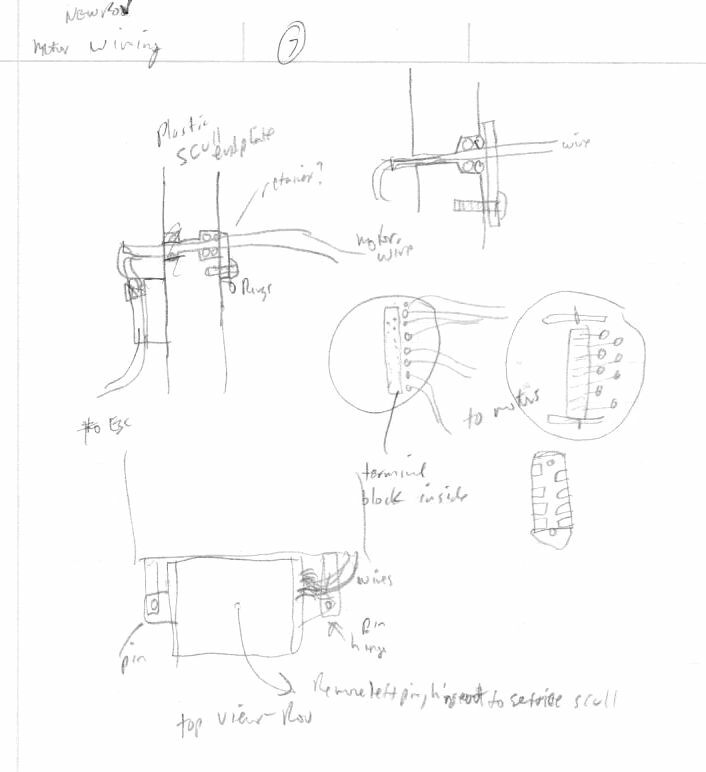 I also worked on the wiring in the SCULL. I cut the motor wires off, leaving enough slack for changes or repairs, and fed them thru the SCULL end plat and it's sealing O rings. For those holes that don't have a wire yet (such as for the claw motors and the tether), I just used a short piece of wire looped thru two holes to seal it. 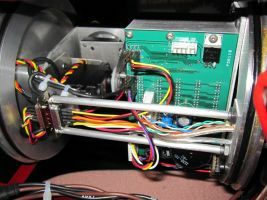 The wiring and electronics are relatively easy to work on--just remove two bolts, hinge out the SCULL, remove the end plug, unplug the camera wires, and remove the end plug. 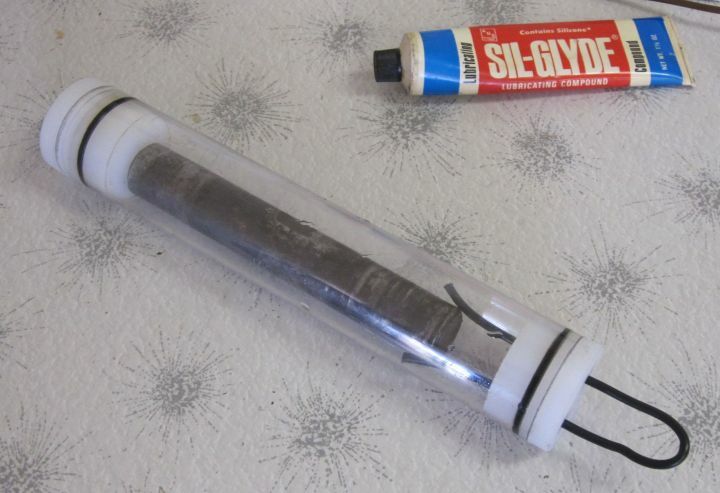 Then remove the clear tube, and get to work. Time for the first water test! I removed the floaties, and dunked her in. No leaks. Work progresses. I fixed the gimbal wiring, added a felt seal to the camera shade, and added the thrusters and a handle to the frame. We've been discussing colors....I like red, as it matches the motors, it's visible, it hides rust, and it's an appropriate color for a gal named Babs to wear. Since I have the frame here, it's probably gonna be red, at least for now. I lightened the SCULL end plates, and worked on the wiring. I decided to put the tether wires between the camera wire supports, and use the supports to hold the O ring retainer plate. I added a clamp to hold the camera wire in place, and later figured out a way to restrain the wires over the servo horn--I'll install two longer screws, and add a plate above the wires to keep them in place. 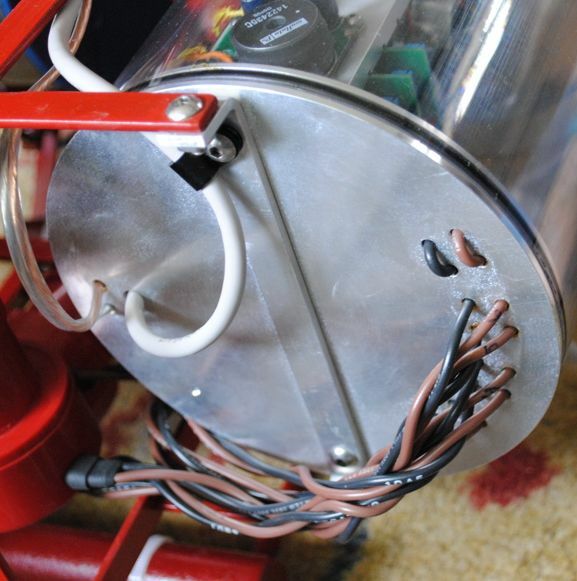 I also need to drill some holes in the rear of the servo mount, so I can do a better job of securing the wires there. After removing quite a bit of material from the insides of the end plates, the SCULL weighs about 3/4 pound less than it did yesterday. And I added a little shade for the camera, to keep the glare out of it. We'll need to add some felt around it to seal it to the tube, I think. 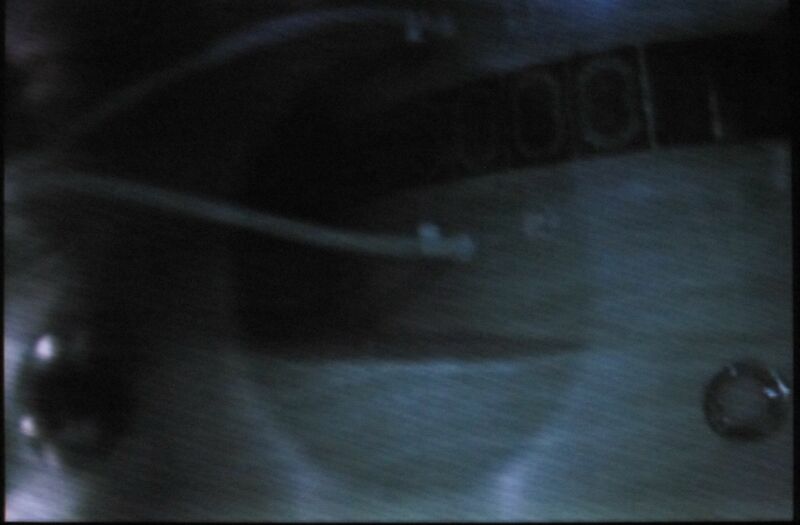 David sent pictures of the circuit board for the pressure sensor. The SCULL is mostly done. 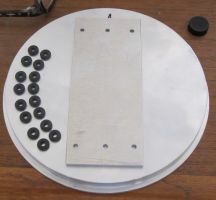 The holes for the thruster motor wires are drilled, and the O ring countersinking is done, as well as the retainer plates. The holes for the manipulator motor and torpedo solenoid wires will wait until we have done some preliminary testing. I cut the tube to length, it is about as short as it can be and still provide room for the moving wires on the gimbal. I also made brackets to mount it to the frame. The frame is also built. I'll weld the thrusters to it soon. I weighed all the parts we have now, which does not include anything for the manipulator, and it's right around 14 pounds. David reports that he made the circuit board for the pressure sensor, so I can make the mounting holes for it in the SCULL. 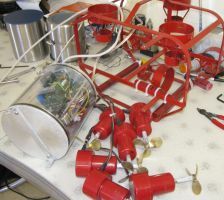 I also have to make the holes for the tether, and find a suitable O ring for the signal cable. The power wires will use the same sealing method and O ring size as the motor wires. I made the camera/light gimbal, although it changed a bit from my previous idea using sheet metal. 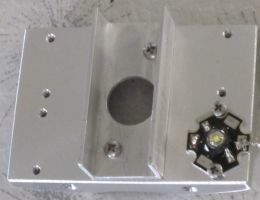 David suggested making the parts that conduct heat from the LEDs out of heavier material, so I made the LED plate out of 1/2" thick aluminum, machined on the back to allow the camera to fit, and the pivoting arm that mounts it is made of 1/8" thick aluminum. The servo arm is polycarbonate, which helps insulate the servo and camera from the heat. I also made two rods that will hold the connector that allows the camera, servo and lights to be unplugged, so the SCULL can be taken apart. The idea is to pull the camera end plate out first, disconnect the electrical plug, and then remove the large clear tube from the other end plate. I'm working on laying out the wiring connections for the motors. 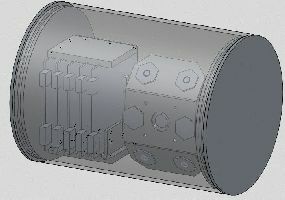 There will be at least 18 holes for motor and solenoid wires, plus the two for incoming power and the larger tether signal cable. 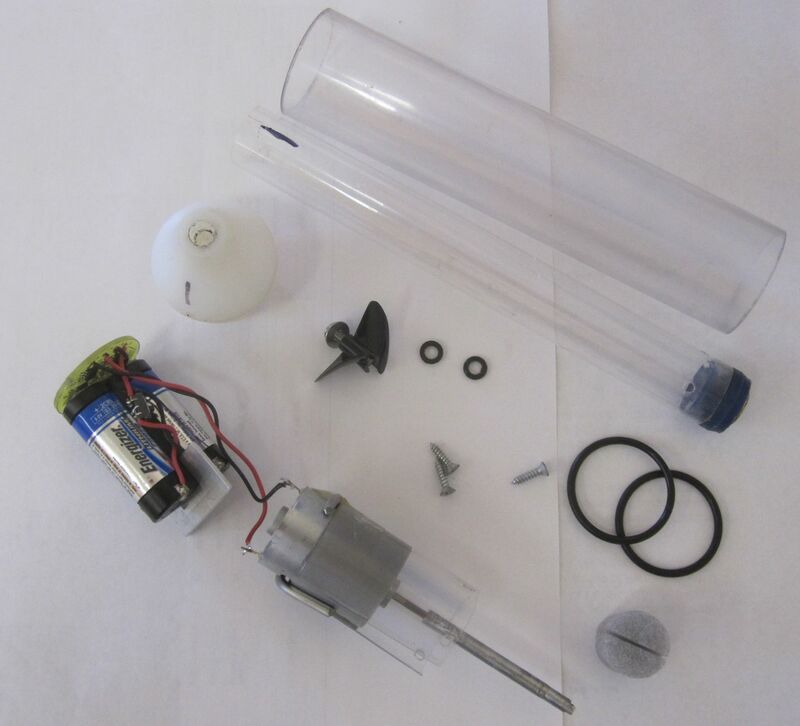 Also we need to make a hole for the pressure transducer, which will be used to measure the depth of Nessie's egg. 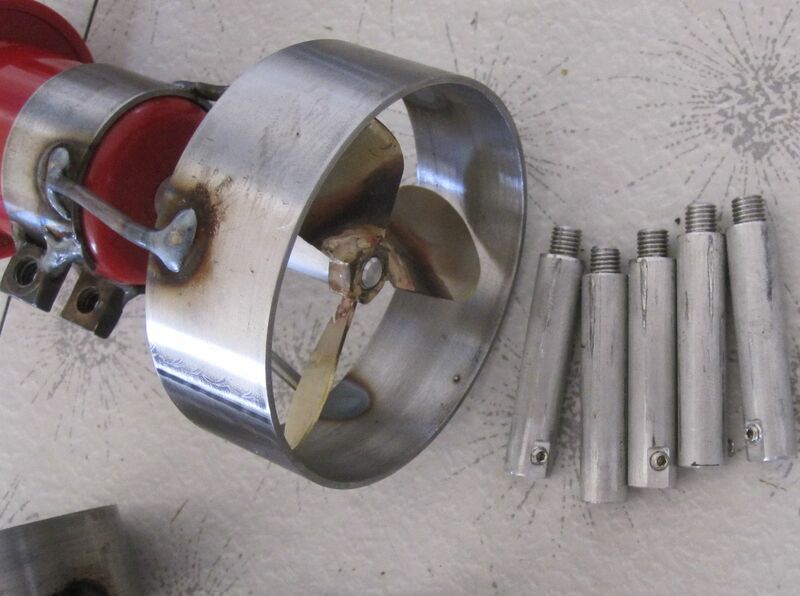 Each motor wire will fit in a stepped 9/32" and 1/8" hole, with an O ring sealing the wire. There will also be a retaining plate holding in the O rings. I think we'll use one plate per four wires, to keep it manageable. The O rings will be installed from the inside, so we can poke the wire thru the hole, put the O ring around it, and push the O ring in with a tube. The O rings will be a rather tight fit, and this is the only way we could figure out how to be able to put it all together. Update...I mocked up the O ring hole to see how it fits. I drilled both 9/32" and 19/64" holes for the O ring to fit into a piece of scrap metal, and also drilled 9/64" holes for the wires. The smaller hole works better, it compresses the O ring enough to give it noticable drag when pulling the wire, and it is not too difficult to pop into the hole by pressing on the retainer plate. I finished the plugs for the SCULL and the second floaty. 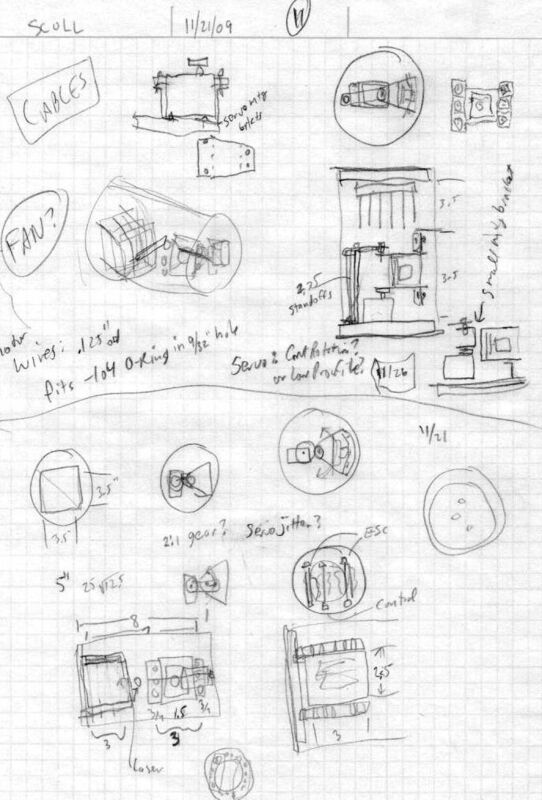 Now we need to figure out the final dimensions for the camera and light mount, so we can try it and see if the basic design works. 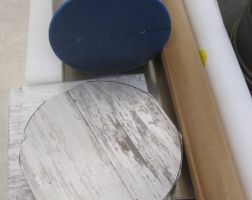 I think I have all the dimensions I need to make a prototype from .050" aluminum. 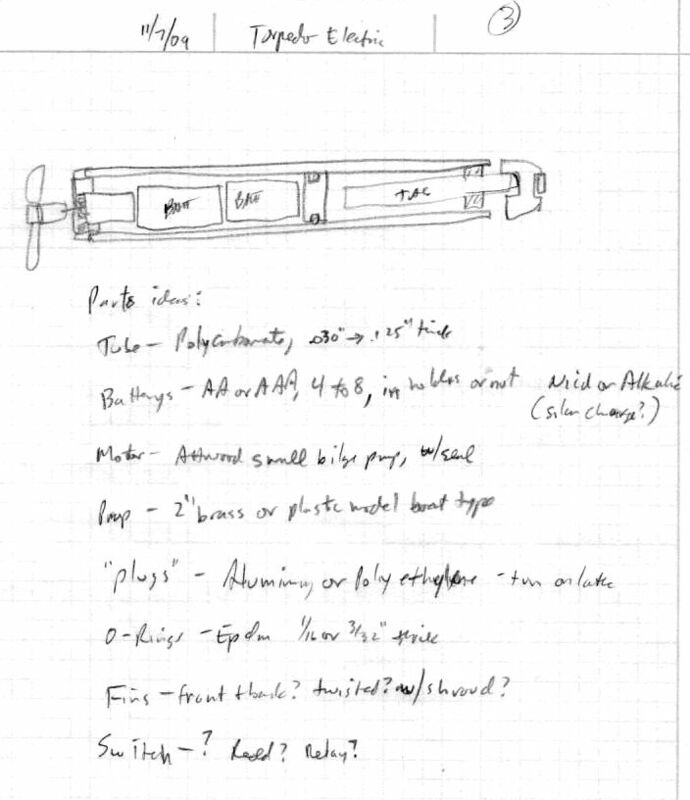 It looks like we might be able to make the SCULL as small as 6 or 7 inches wide. 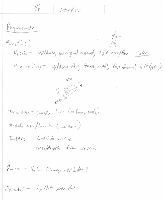 I also did a brief project review, rereading all the notes from the beginning. It looks like we're on track with the design, we have addressed all the weak spots in last year's design. I have been working on shop equipment, I got my 40 year old drill press working again, and got my swap meet $20 50 year old band saw running. 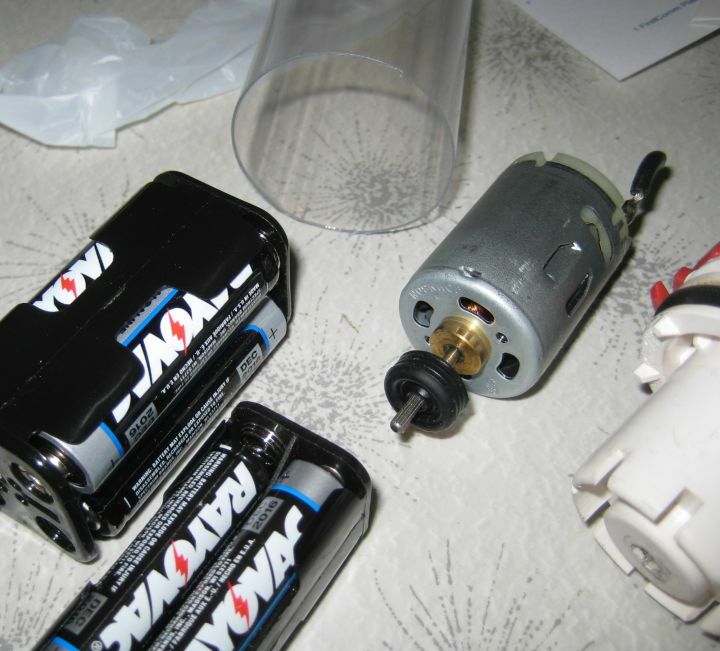 I also started working on making the plugs for the Sealed Compartment for Underwater Lights and Lectronics (SCULL). And the first floaty plug is done, it is made of Ultra High Molecular Weight poleyethelyne. David has continued working on the ROVotron control system. The programming for the configuration system is mostly done, and he has tested the video, sound, and servo functions. 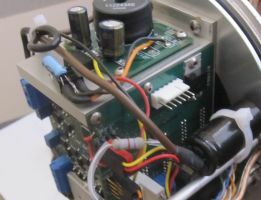 The servo power supply needs a capacitor added to handle the sudden load on it's power supply when the servo is moved. Other than that, it all seems to work just as designed. He also had a CNC metal shop fabricate the mounting and heat sink parts, as they are a bit too complicated to make in the home shop. I finshed the thrusters. 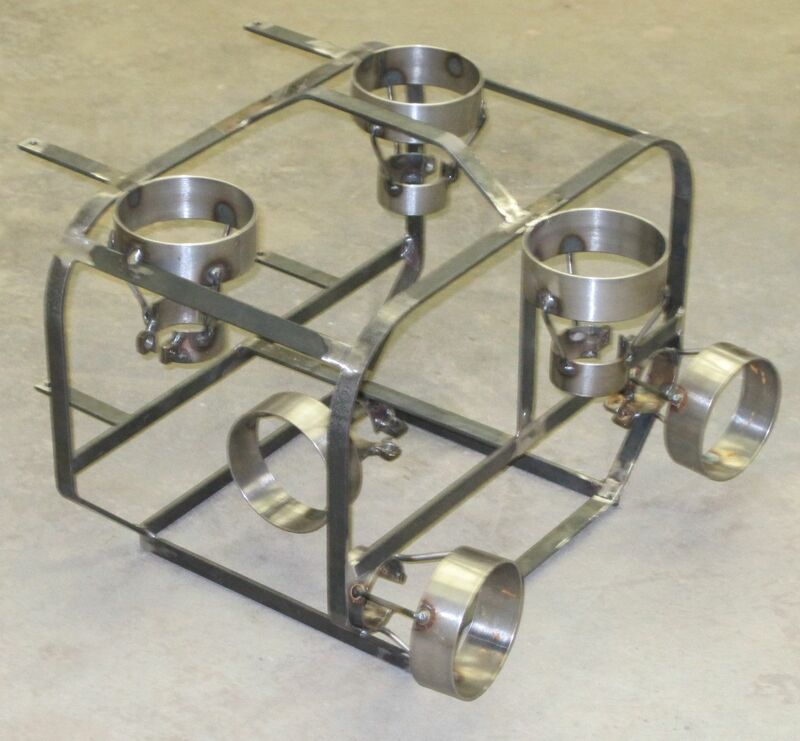 They still need to be mounted to the ROV frame, which has not been completely designed yet, let alone built...but they're ready to be welded on when the time comes. 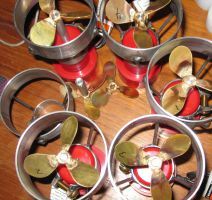 The propellers are all soldered together, and the shafts are made with the threads on the prop end, and setscrew on the motor end. The aligment seems to be pretty good, and with the relatively narrow clamp, the motor angle can be adjusted slightly to center the prop in the shroud. 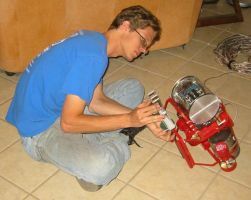 David has been hard at work on the control system, he even figured out a name for it--ROVotron. 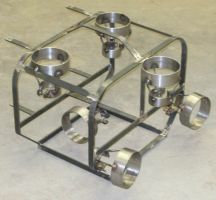 You can visit rovotron.com as soon as the name propagates through the internet. 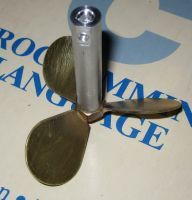 I built another propeller today. First I had to build a jig. 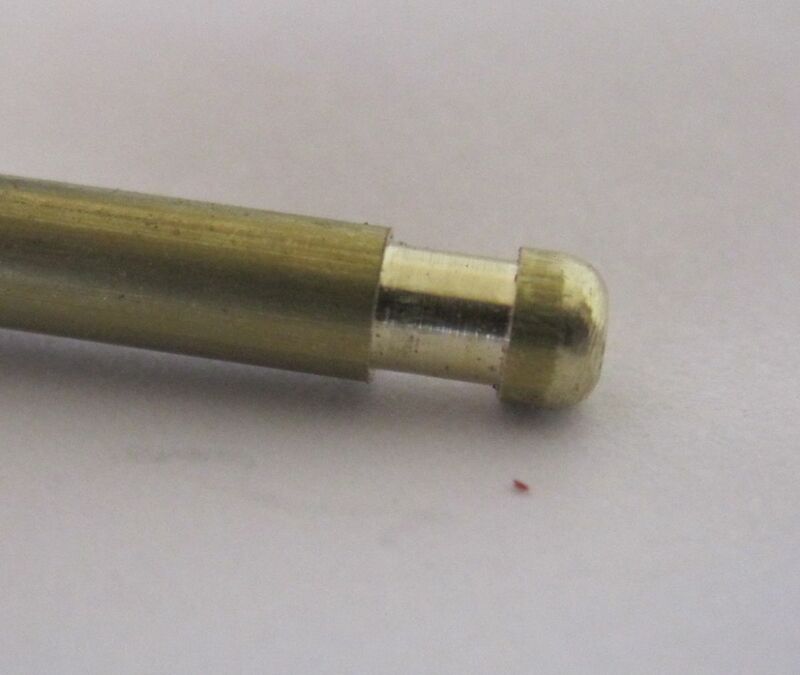 I also made an adapter shaft, with a threaded end that fits into the prop center nut (which has a 1/4-28 thread). And I started working on the Bill of Materials. Quite a bit of progress has been made over the last month or so. David has assembled and began testing the control system. Pictures and description of the system are here. It turns out the PS2 controllers have a larger deadband than anticipated, but should still work. The camera has been tested in low light conditions like what we expect during the competition, and the results are very nice. The frame configuration for Babs has been finalized, for the most part. Replacing the single rear float for two that run lengthwise puts the center of mass and center of volume closer to where they need to be, as well as adding more floatation. 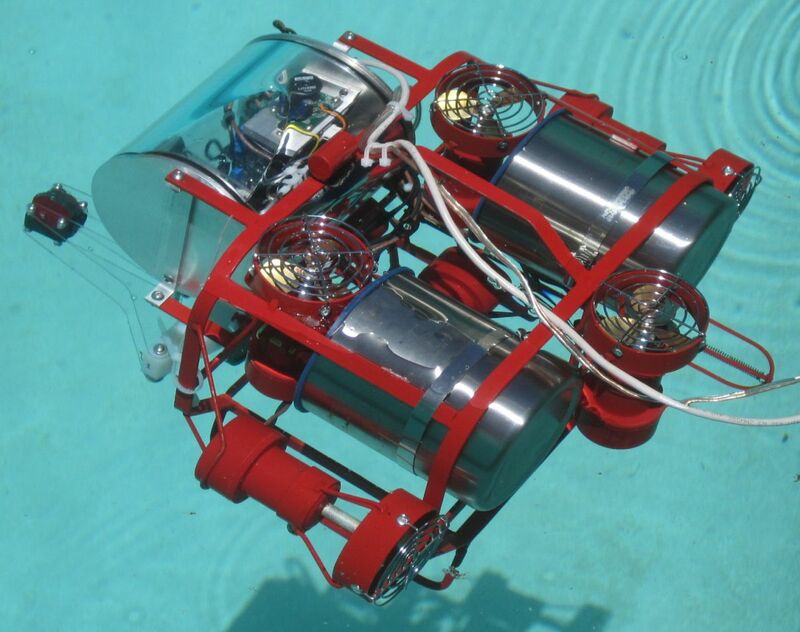 The entire ROV is more compact in this configuration as well, giving Babs a sleek, attractive figure. We found some nice looking stainless steel cans at WalMart that will serve as the rear floats. 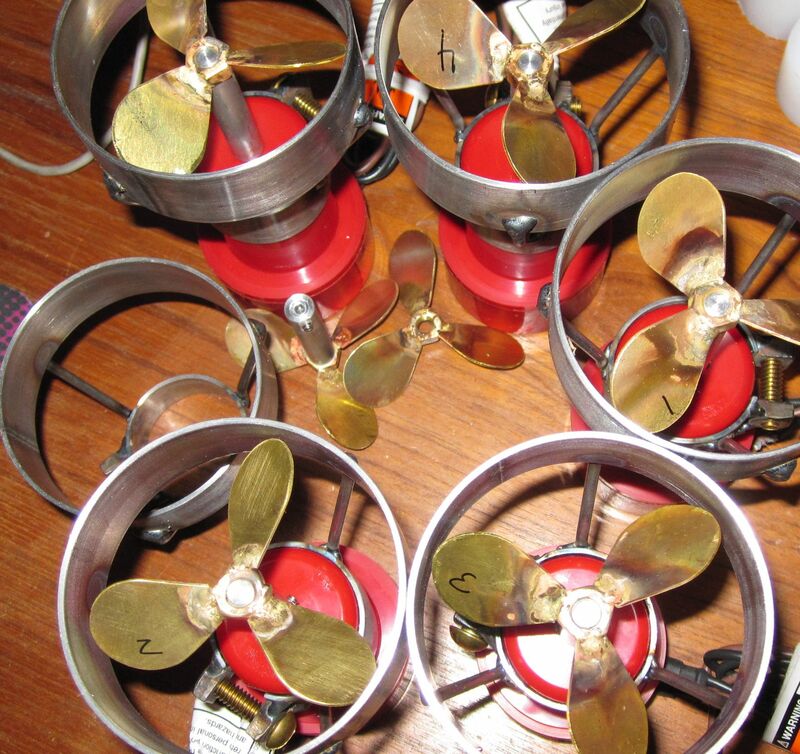 Thruster motors were ordered and came in the mail. We figured out a system for mounting the thrusters and nozzles that is easy and accurate enough to use on the final robot. Rings cut from 1.5 inch and 3 inch exhaust tubing are welded together with steel wire, with a slot and mounting bolts for the motor to be clamped in with. 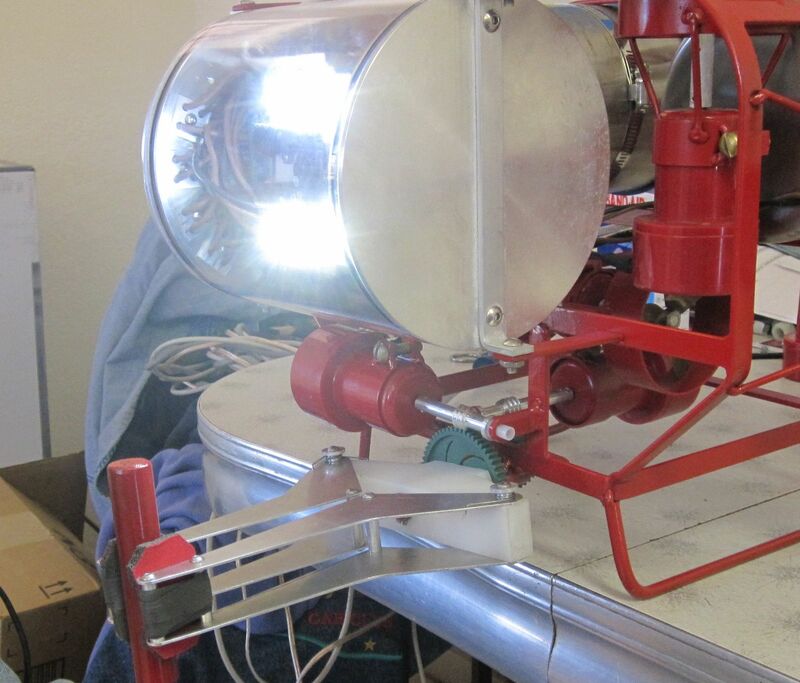 No more hose clamps needed, and the thruster bracket is easy to weld to the frame. 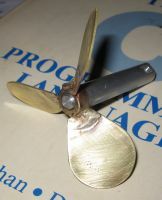 We also made a first run at homemade brass propellers (to replace the $30 ones we used last year). At less than $1 for materials, these seem like a nice route to take. 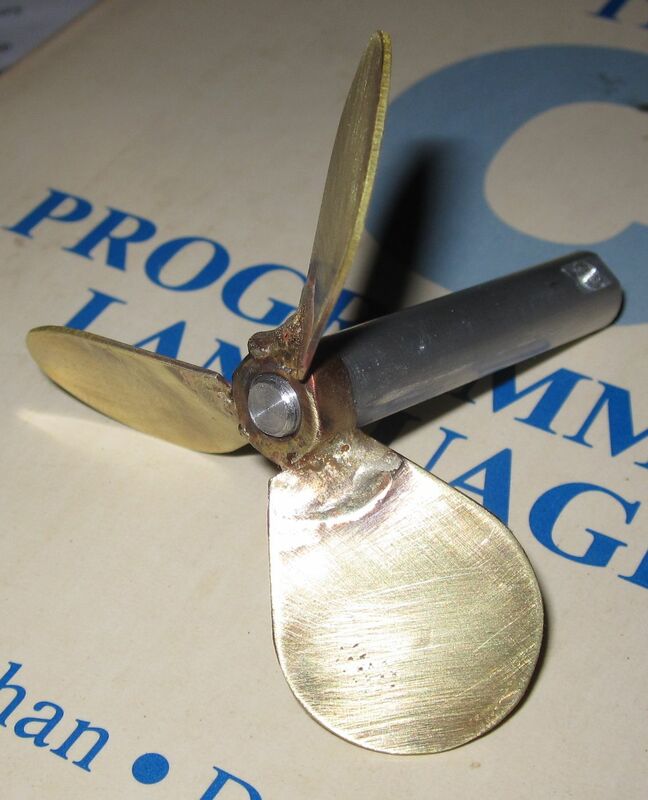 We still need to experiment with the soldering jig to get the propellers to come out consistently, but the final propellers should work out good enough for the two hundred dollars we will save. The claw design is coming along, too. We decided that the best way to power both the gripping and twisting motions of the claw would be through a worm gear off of the same bilge pump motors used for thrusters. This puts the speed of the mechanism closer to something usable, since we do not have as much room as last year to use large linkages to slow the claw down. We made a test worm gear on the lathe to mesh with plastic vEx gears. 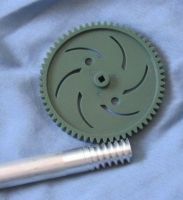 The plastic gears have a pitch of about 7.77 teeth per inch, and we are able to make a worm gear with 8 threads per inch on the lathe. Certainly not a precision operation, but good enough for our application. Lots of details still need to be worked out. 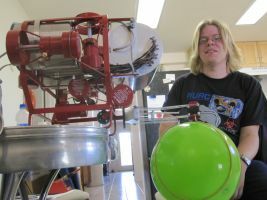 I've been very busy heping the NERDS with their FRC robot. Steve has been very busy with school. David has been busy with Nixie watches. And we had some excitement around here....last year's ROV on the cover of SERVO magazine! 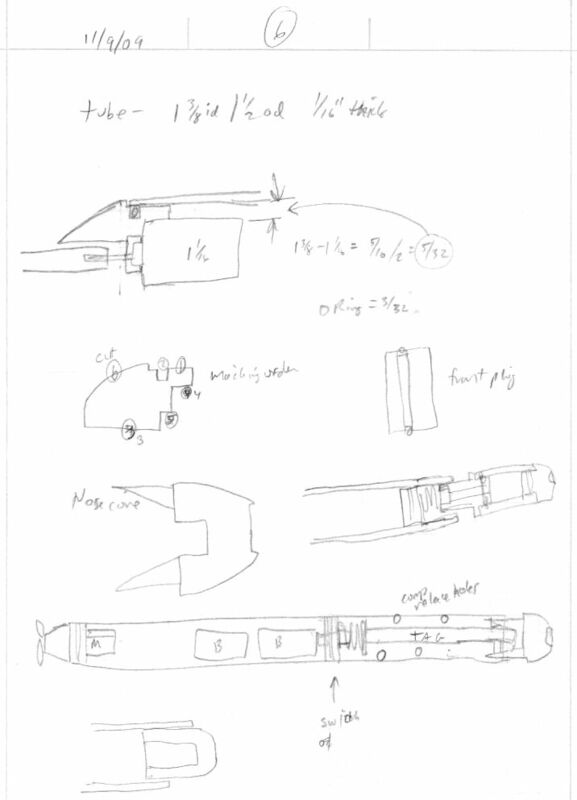 But we did get back to thinking about the ROV, and Steve made a couple renderings of a design concept for the claw, as well as the thruster layout and torpedo launching mounting. "Here's what it looks like with the latest configuration of ideas. The tube is 8" wide, which is what we were aiming for, and seems roomy enough inside to be manageable. If all of the wires exit through the control side of the SCULL, it will be cramped but they should all fit. We probably need to look more at the kind of servo we want to use. Size doesn't seem to be much of an issue; there's lots of room for it. 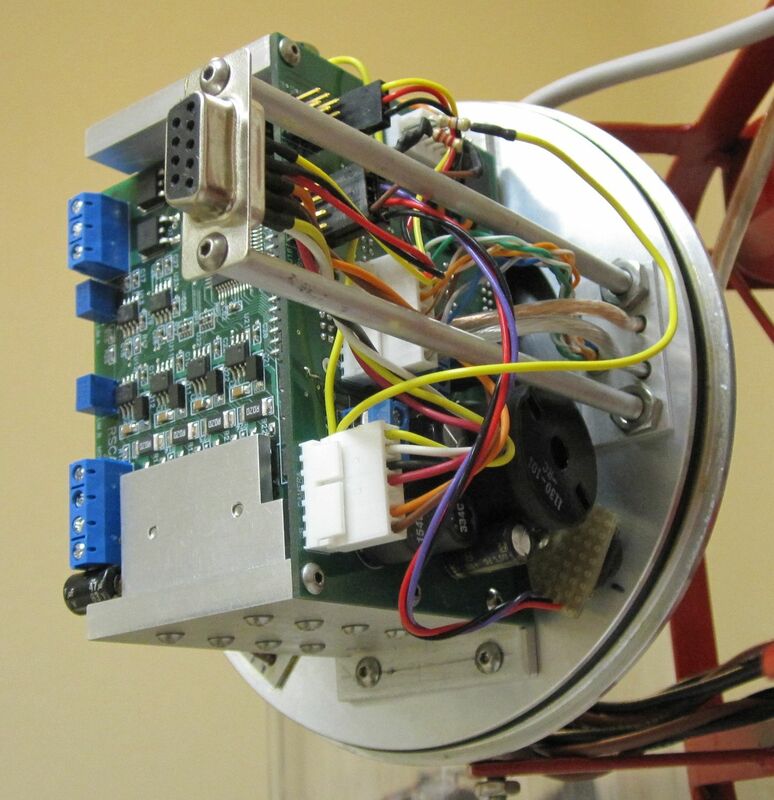 It seems like we'd want a servo with a physical stop so the camera assembly doesn't try to rip itself apart if we send it a bad signal, but this may not be anissue. 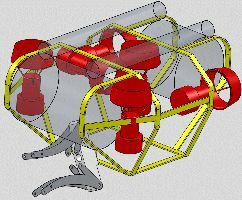 I need to model some more entire-robot configurations so we can see how the thrusters fit for some of the different ideas we had. I'll try to do some of that later tonight or tomorrow." 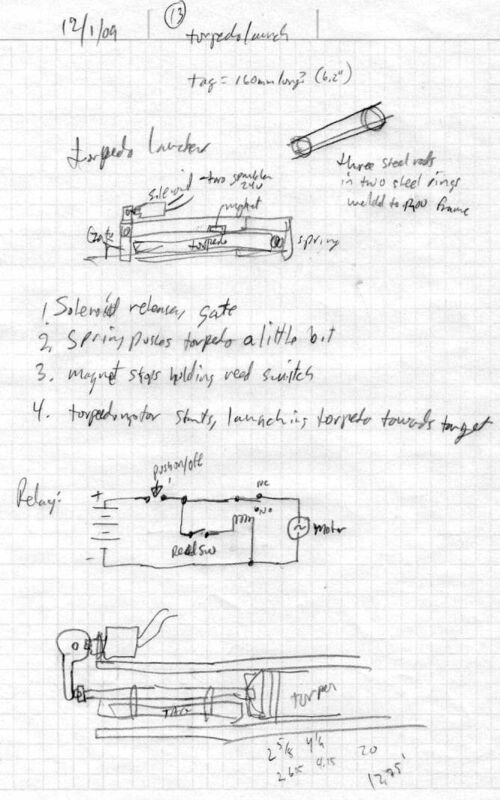 David has been hard at work on the electronics design. 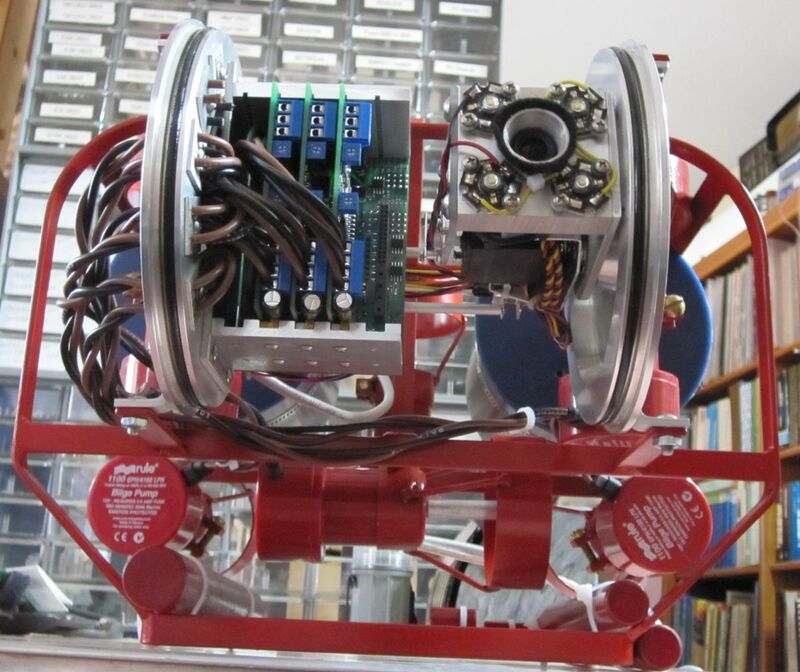 He has the circuit board for the ROV mostly designed. The plan now is for a backplane with the control and power supply parts, and up to five two channel daughterboards to drive the motors. Steve and I did an experiment with a wire and some O rings, to see if this is a feasible way to seal the motor wires that will go into the ROV. 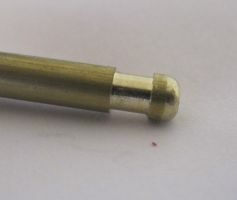 We made a couple plastic end plugs that fit some leftover torpedo tubing, and drilled and countersunk two holes in one. The holes are sized for the motor wires to fit, along with an O ring around each wire. 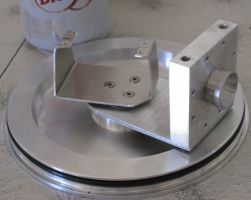 The countersunk holes are small enough to compress the O rings properly to seal the wires. 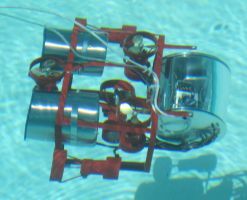 We put a weight in the assembly, and lowered it into the swimming pool for about five minutes, took it out and did not find any water inside. We need to work on the design a bit more to make it easier to install the O rings, perhaps using two O rings per seal, and to make a retainer to ensure they do not come out accidently. We also would like to test them with a bit more pressure (for example, in a deeper pool). 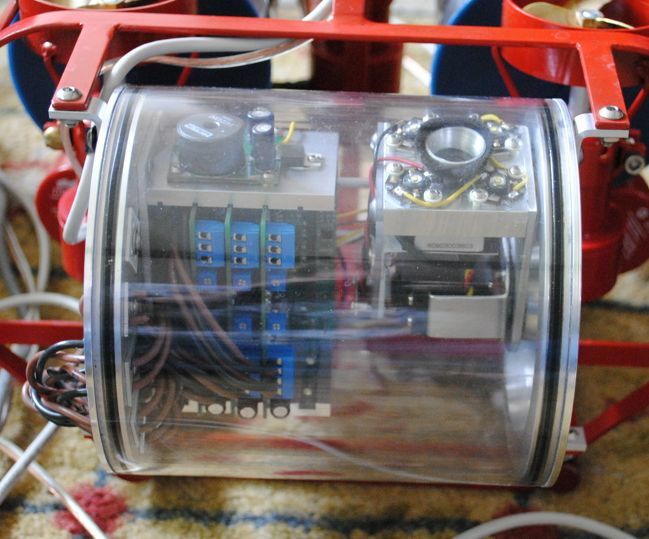 We installed the circuit that David made into the torpedo, and tested it a little bit. It need some adjustment to get the switch to work properly when it hits the target, but the circuit does it's job of turning on when activated by a magnet, reversing when the switch is activated, and turning off at the appropriate time. 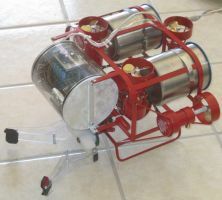 The motor runs for about ten seconds if it does not hit a target, which seems a bit long, we might try to reduce it to five seconds. 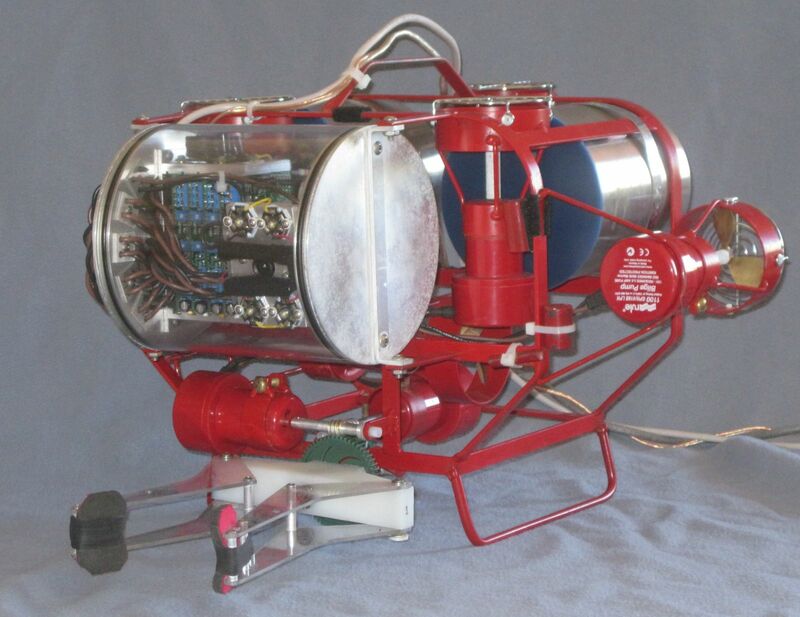 We also need to build the launching mechanism, and try it out on notBob for fun. We are also contemplating how to aim the torpedo. 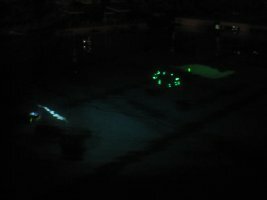 We have the idea to use a laser to point at the target, but are concerned about safety--there will be divers in the pool, and we don't want the laser to point at their eyes. 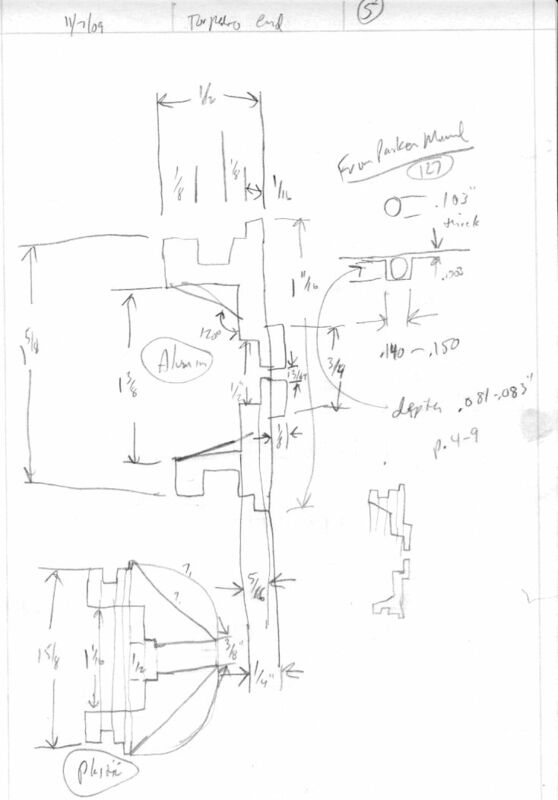 David has been working furiously on the torpedo problem, here is the current plan. 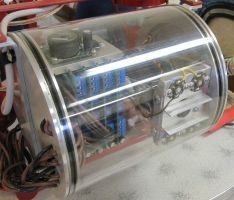 The Quest for Nessie mission requires the ROV to deliver a radio tag to Nessie and attach it to her body. The radio tag is simulated with a 10cm glow stick, and Nessie is simulated with a sheet steel cutout. The radio tag must be delivered by an untethered vehicle, through a launch gate, then through a targeting ring, then to Nessie. The distance from the launch gate to Nessie is assumed to be less than 10 meters. We have chosen to implement the radio tag delivery vehicle as a torpedo with the glow stick placed into a holder in the front end of the torpedo. 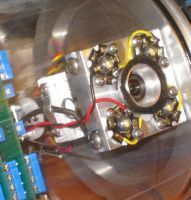 A rare-earth magnet disc is attached to the frotn end of the glow stick holder. 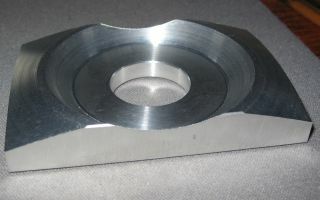 This disc may be suspended on a spring to give compliance in case of an angled impact. The torpedo is electrically powered and contains a reversing switch to pull the torpedo off of the glow stick on impact. There are motor timeouts to prevent wayward bvehavior: 10 seconds for forward in case of no impact, and 1 second for the reverse travel. The torpedo is neutrally buoyant with the glow stick installed, and slightly positively buoyant with no glow stick. Thus, retrieval may be done from the surface. 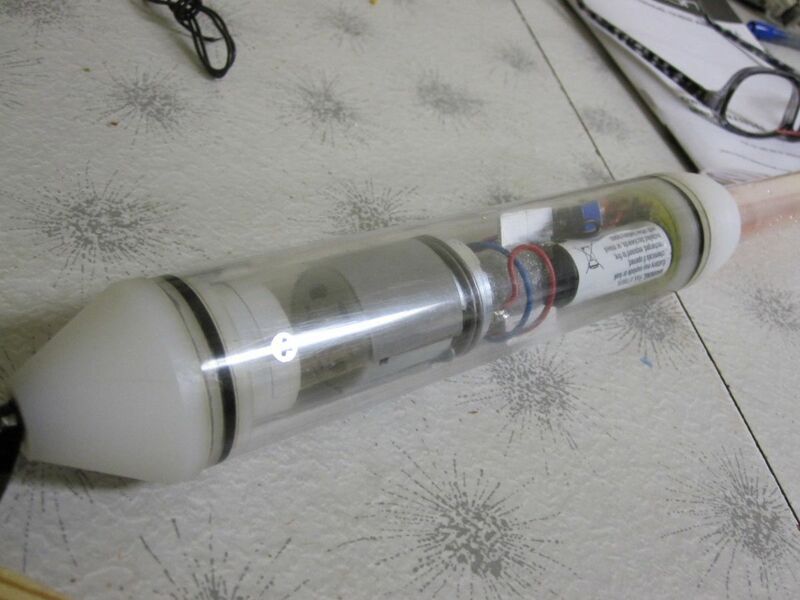 The torpedo is a plastic cylinder 1.5" in diameter with a motor, some batteries, and a controller inside. The front end has a receptacle for a "radio tag" glow stick with an attached rare-earth disc magnet. The rear end has a propeller. 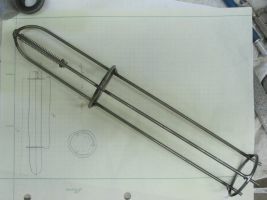 The prop may be small enough to fit inside the tube, in which case the tube extends past the prop on the rear and there are large holes drilled into the tube to permit water to flow into the prop. The batteries are two sets of four AAA alkaline cells in square plastic holders. 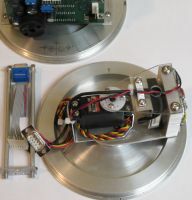 A round controller PC board is mounted to the front of the forward battery holder. The PC board has a switch that presses against the forward plug on impact with Nessie due to momentum transfer from the batteries. 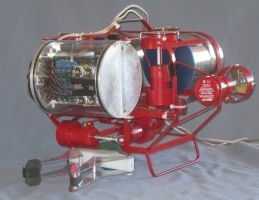 The motor is an Attwood bilge pump motor. 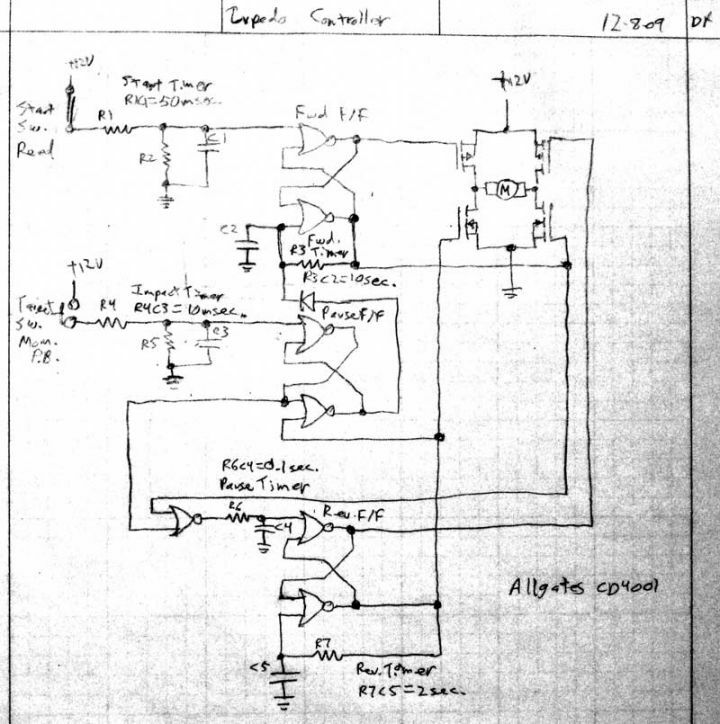 The circuit to do this is a pair of CD4001 quad NOR gates configured as three R-S flip-flops. Several RC timers ensure correct timing. 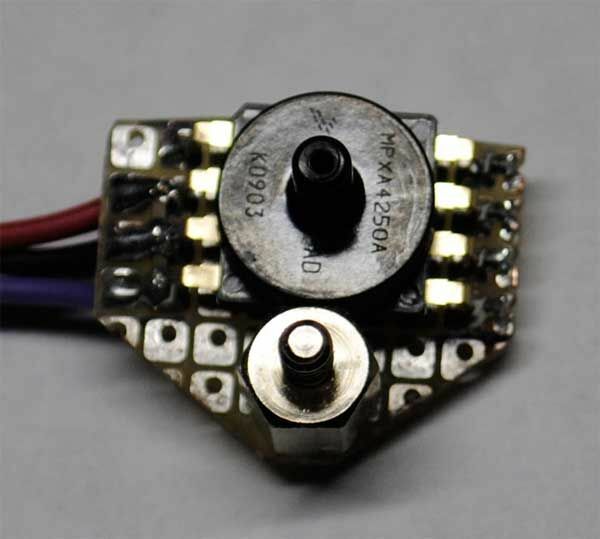 Two complementary MOSFET pairs comprise an H bridge to reverse the motor on target impact. The torpedoes must be launched by command from the controller. A separate arming switch will prevent accidents. Each launch tube has a lawn sprinkler valve solenoid to release a catch. 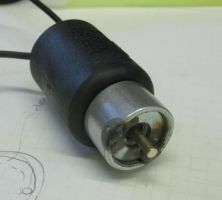 The solenoids may have a common arming signal which activates a motor driver channel, and three N-channel MOSFET low-side switches to launch the selected torpedo. 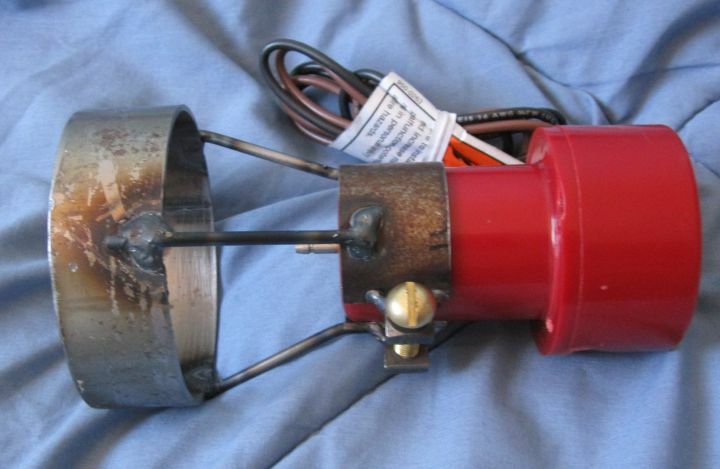 I tested a Toro ($8 at Home Depot) sprinkler solenoid. 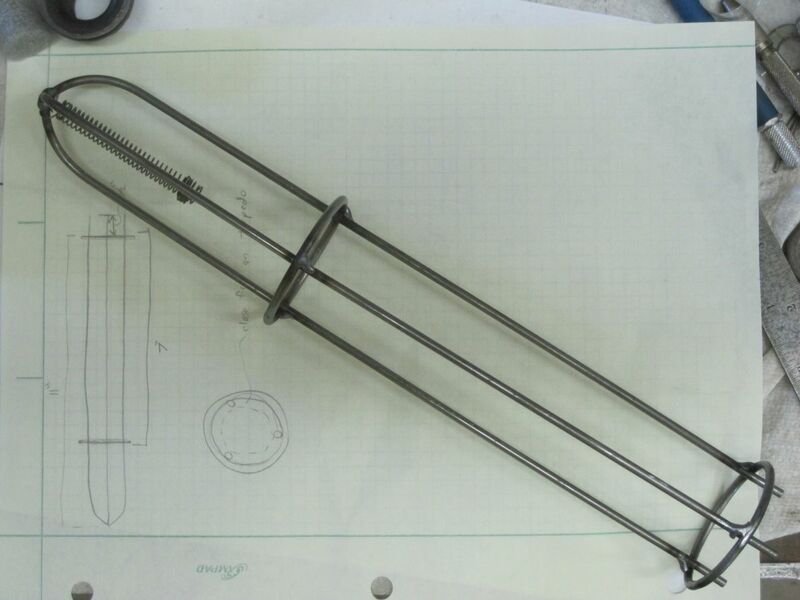 This unit has a metal plunger with a weak return spring. It pulls in with zest at 24VDC at 1.0 Amp. It pulls in with wimpiness at 12VDC. Shorter travel makes for a stronger pull. At 1/16" travel, it's difficult to hold back with fingers. I attached a 6-32 screw to the plunger to make it easier to experiment with. The torpedo launcher coils will be powered by a 2200uF capacitor charged to 48V through a 10K resistor. This is because they only need an impulse, not a steady supply of current. 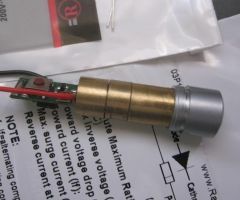 The arming switch turns off a shorting transistor across the capacitor to allow it to charge. 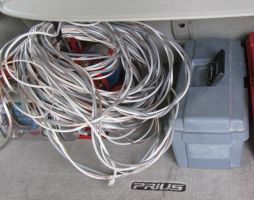 The capacitor's positive terminal is connected to the high side of all the coils. 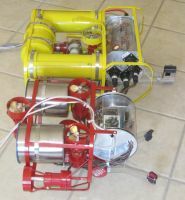 Each torpedo coil has a trip transistor to ground its low side wire. A 1N4004 diode protects the capacitor against reverse voltage from the coils. 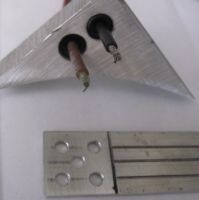 The above capacitor will be bolted to some end plate inside the SCULL. The other parts will be wired directly to the capacitor terminals. 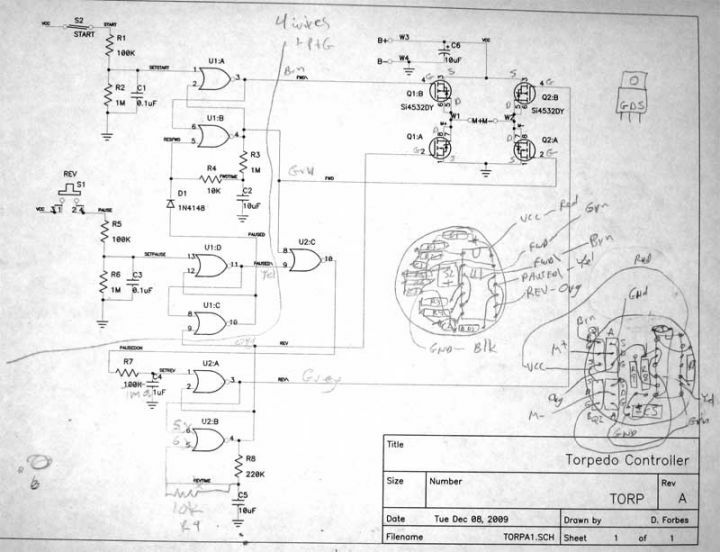 The transistors are on the computer board." We've been playing with some ideas, but not much hardware. 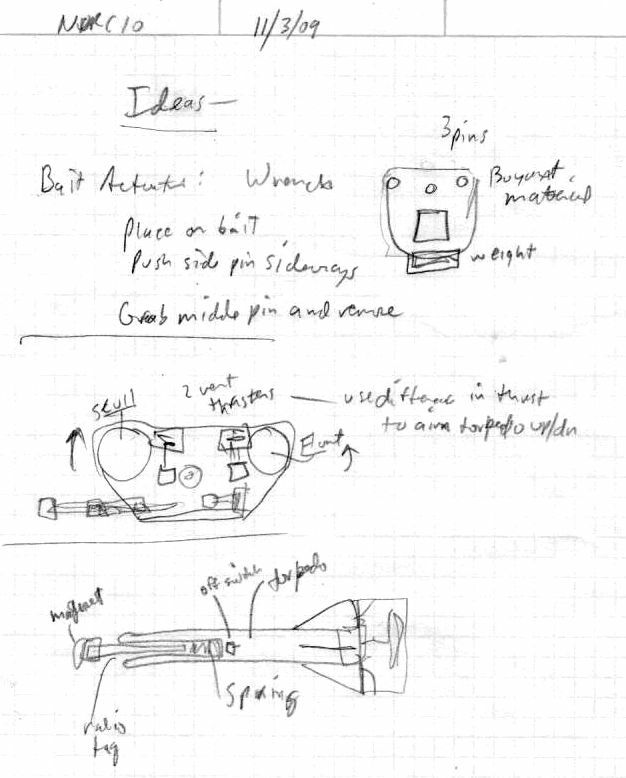 David has been refining the control system design. He and I have been working on the torpedo launching problem. It's challenging. 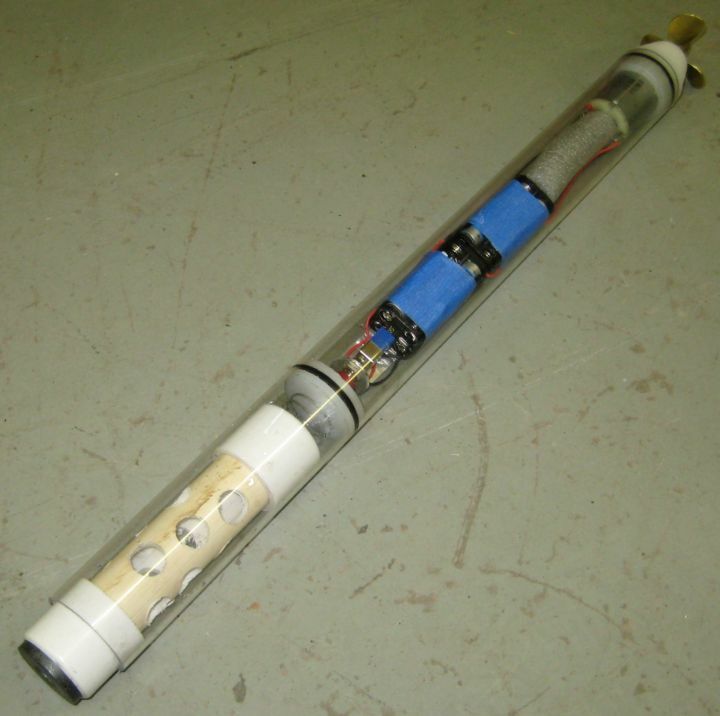 To give us something to play with, I wired up a reed switch and relay into the torpedo, so I can launch it using a magnet to turn on the motor. Holding the magnet on the torpedo keeps it turned off, pulling the magnet away makes the motor run. The idea is to let the torpedo sit in the launcher with a magnet next to it, and a spring behind it, and a door or catch holding the front. 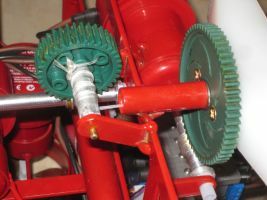 When the catch is released, the spring pushes the torpedo out a little ways, enough to let the motor turn on as it moves away from the magnet, and then it takes off. 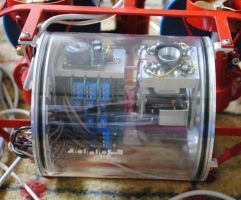 David is also working on some ideas for electronics in the torpedo, to allow it to reverse direction when it hits the target, and to have a timer to turn off the motor after so many seconds...so it will not keep roaming around the pool forever. The divers have a tough enough job already! David had another idea for launching the torpedo, shown below. 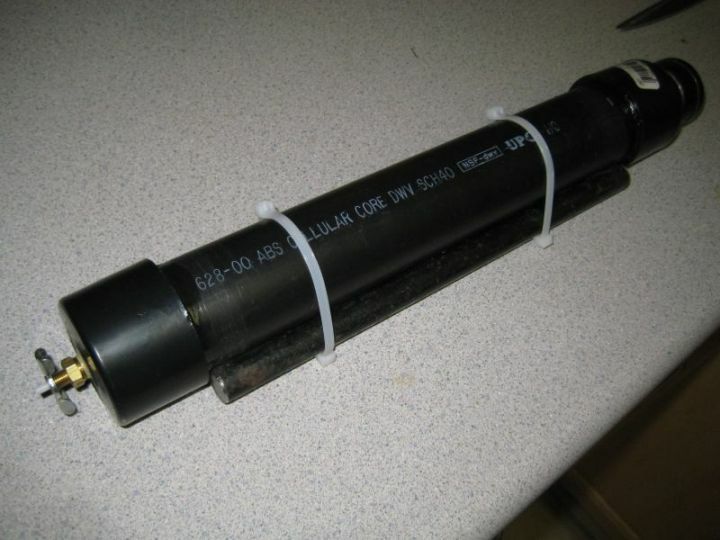 The launcher is made of aluminum, and would hold 3 torpedos. The torpedos would be held by a catch on the side, not by blocking the front. 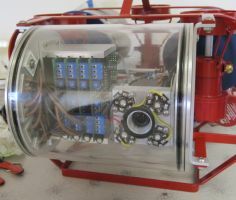 I also thought more about the SCULL (sealed compartment for lights and lectronics) and mounting the camera and speed control stuff. We'd like to find a full turn servo....they are hard to find. 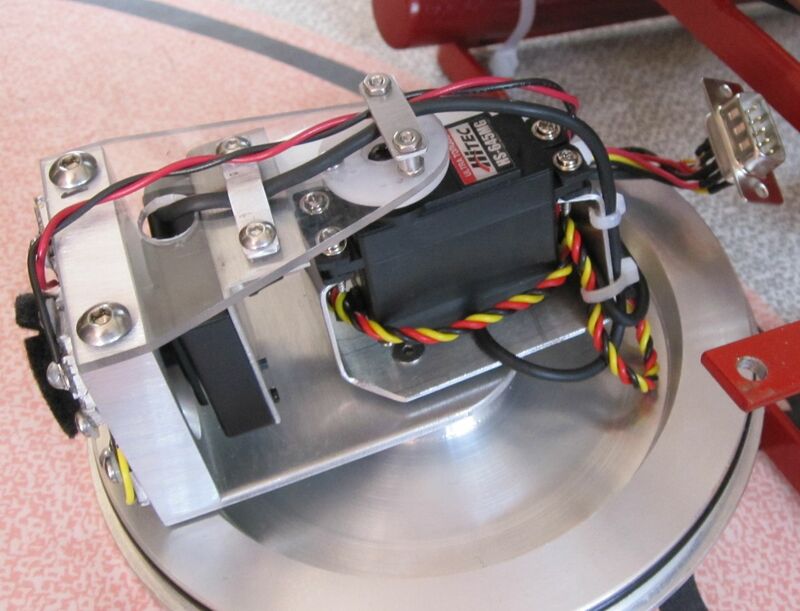 A normal servo will turn a bit more than 180 degrees, but is designed to only use about 60 to 90 degrees of motion. 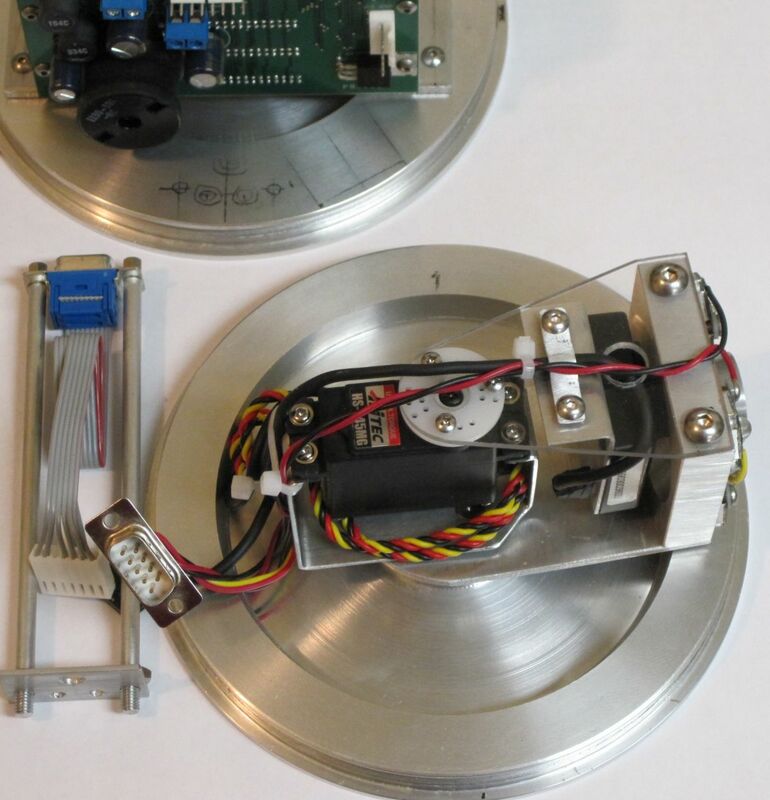 We will experiment with both a continuous rotation servo, and a normal servo, and see if we can get one to do what we want, which is to be able to see up and down. 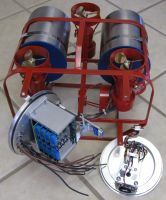 I also talked with Steve about the manipulator, and differnt ways to arrange the thrusters to control ROV attitude. One new idea is to have the two vertical thrusters next to each other, but have an additional forward thruster, mounted low at the center. The torpedo aiming could be done with differences in forward thrust between the upper and lower thrusters. We are also still working on manipulator ideas, we have not gotten very far with it yet. 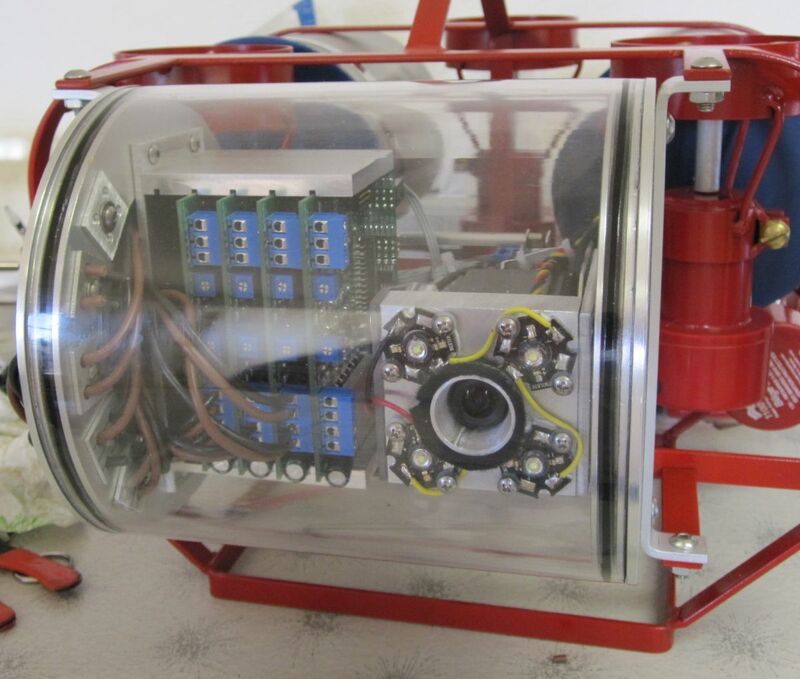 The ESC4A ROV controller board from 2009 worked very well. Its shortcomings were mechanical--the large board presented difficulty in mounting and fitting in the SCULL. 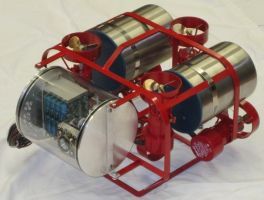 The Vex controllers also offer limited flexibility and require two operators to control all ROV functions. 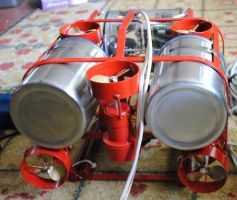 The Nessie mission requires more digital control outputs, and it is desired to add thrusters to improve vertical travel speed. 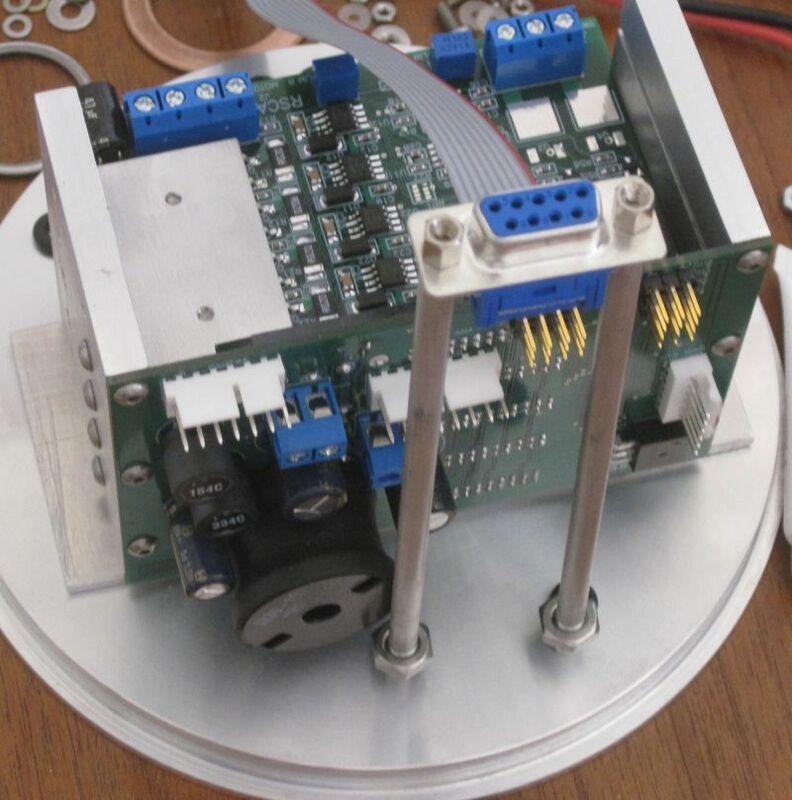 The ESC4A boards are reaching the limits of their capabilities with these added functions. A new approach to packaging is being pursued this year. 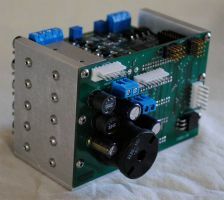 Instead of a large, multi-function board, the design is being split into a motherboard/daughterboard system with a backplane carrying the commands to each output board. This brings two advantages: Compactness and flexibility. Any combination of devices using up to 16 control channels may be connected to the backplane. The backplane accepts several different boards. The main board is the receiver. It receives the serial data stream from the tether and converts it to parallel data for use by the driver boards. The driver boards will be made in at least two flavors: a dual-channel motor controller and a digital interface. The motor controller is electrically identical to half of an ESC4 board, with a smaller XCR3064 CPLD chip to drive two PWM channels from a parallel speed data bus. 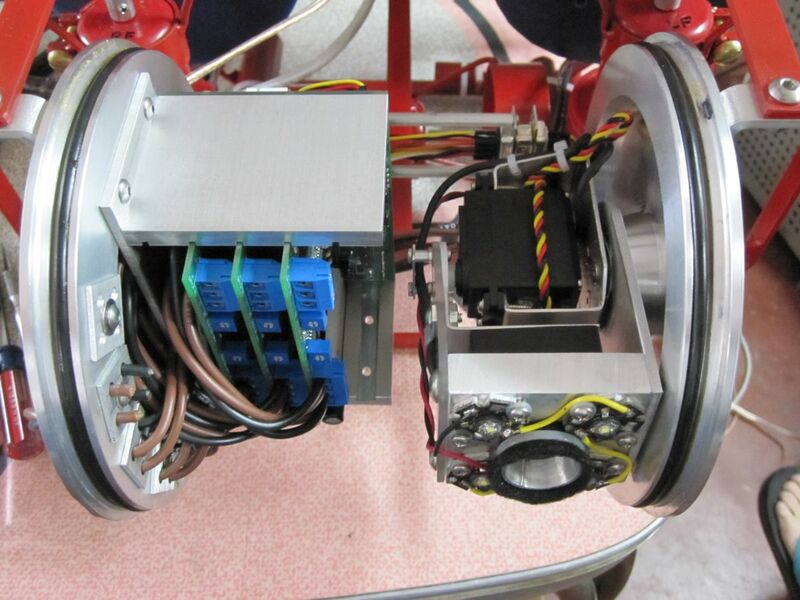 The electrical specifications of the motor controllers are unchanged from 2009. The digital interface board contains four channels of lamp/solenoid drivers. It may have other functions yet to be determined. The transmitter is being completely changed as well. 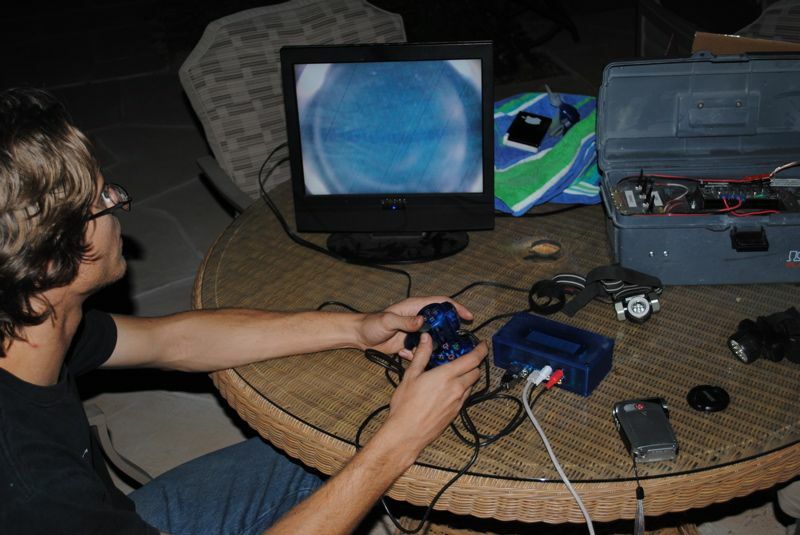 The Vex controllers are being replaced with a single Sony PS2 Dual Shock 2 controller and a custom microcontroller-based interface to the tether. 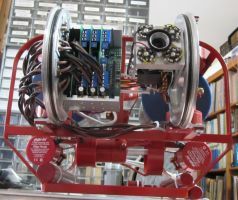 The microcontroller will provide a means of scaling, merging and allocating joystick and button positions to ROV control channels. The channel allocation system will provide more flexibility than the Vex transmitters are capable of. 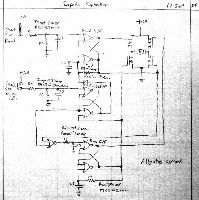 The microcontroller is to be designed and programmed in such a way that it is not difficult to change the control configuration at poolside. This method has not yet been figured out. But we have 6 months in which to procrastinate before cobbling something together in late May. The serial interface down the tether is likely to be asynchronous RS-422 using human-readable data. A 19200 baud stream contains a preamble string, three hex characters per channel plus one newline per frame. The advantage of human-readable data is ease of debugging control problems. 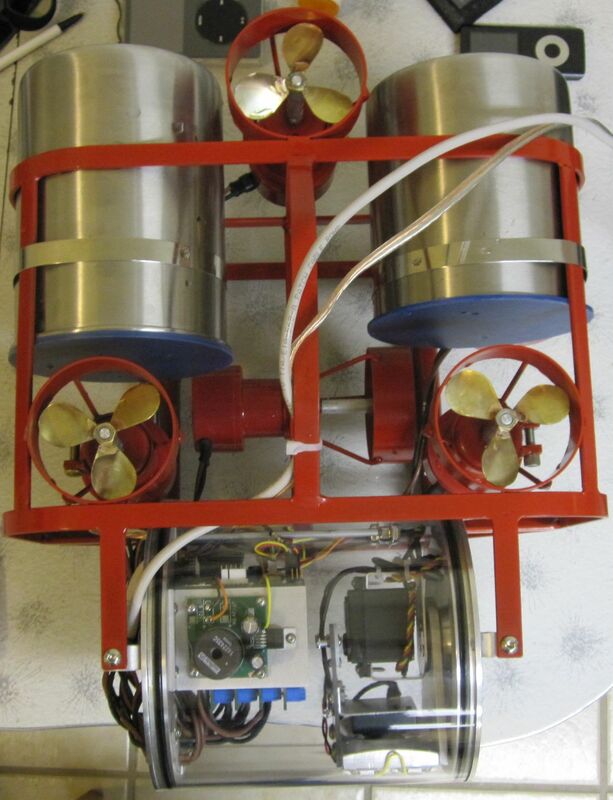 The system will still run from 48VDC with a 12VDC converter in the ROV." I've been waylaid by a tooth abcess and consequent root canal therapy. Now, back to work. We made a short list of lessons learned from the previous competition, about the ROV notBob. 1. Size/Weight: Robot is kind of bulky and heavy. Hard to carry, the front hoops catch stuff underwater, and it moves up and down sort of sluggishly. The electronics connectors add a lot of width and susceptible wires. 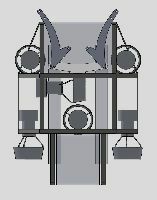 Could be made lighter, smoother, and have more vertical thrust. 2. Lights: The LEDs worked great, but the long range halogen light was not really needed, and was not used during the mission. 3. 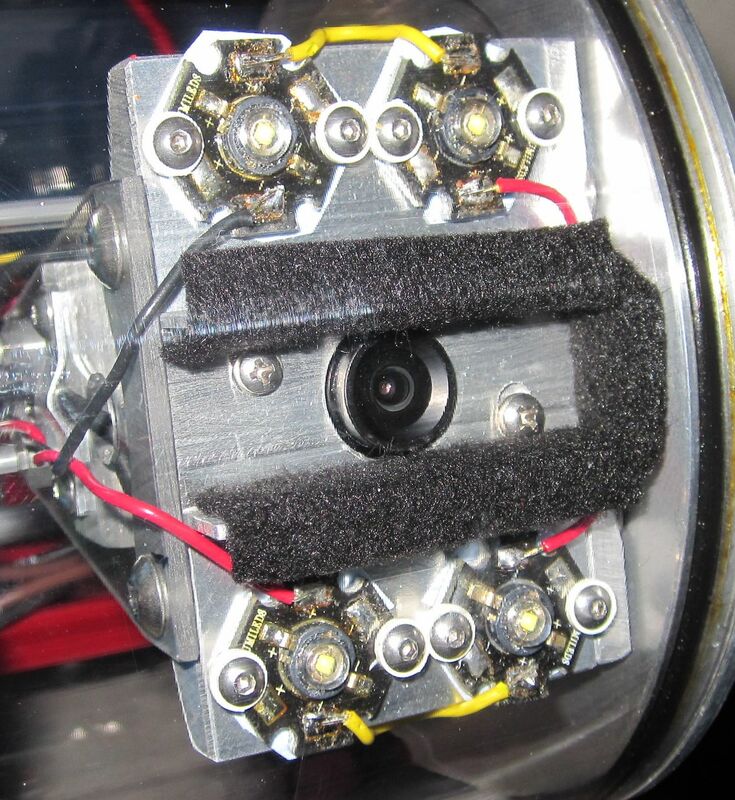 Cameras: We did not use the stero vision during the competition, because we had not set the camera angles properly for it, and we discovered that we could see adequately with one camera. Our extensive practice driving probably helped, as we were very familiar with finding our way and manipulating objects. We did notice other teams had higher quality cameras than we did, and had better low light visibility. We could look into getting a single, better camera. 4. Control: Having two separate controllers and two operators is kind of hard to coordinate, it would be nice to have all the controls on one unit, operated by one person. 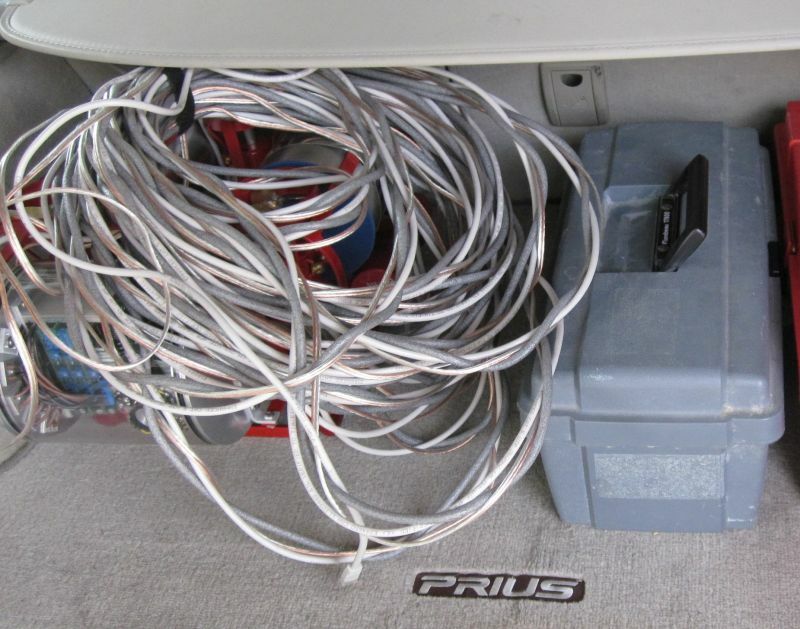 Having the control unit be very small would help as far as setup/transportation, too. And it would be nice to have it run off the main power supply instead of having to charge separate batteries. 5. Packaging: We need a cart! 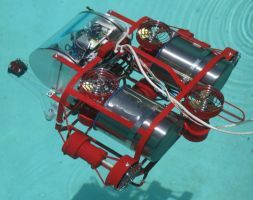 the ROV, suitcase, and battery pack get heavy when being carried for much distance. 6. 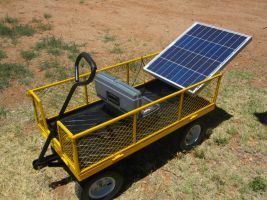 Power system: The 48v supply and solar charging system with the batteries and charge controller in one case worked very well. It would be nice to have enough battery capacity to run at least an hour, for practice/test sessions, since solar charging can only happen during daylight hours, and realistic practice can only happen at night. 7. Manipulator: The wide grabber worked well for many tasks. The design is rather bulky, and might need to be changed to suit different missions. 8. Tether: The floaty tether worked well. It is kind of bulky, and a smaller tether would be easier to transport. 9. Moving Camera: The tilting camera was very helpful. It would be nice to give it a full 180 degrees movement, from straight up to straight down. 10. 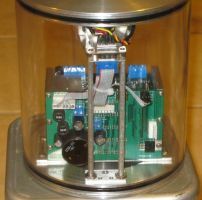 Construction methods: The steel framework worked well, the electronics enclosure worked well. 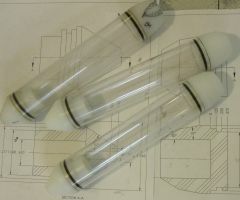 The ABS floatation tanks were rather heavy for their size because of the pipe caps. 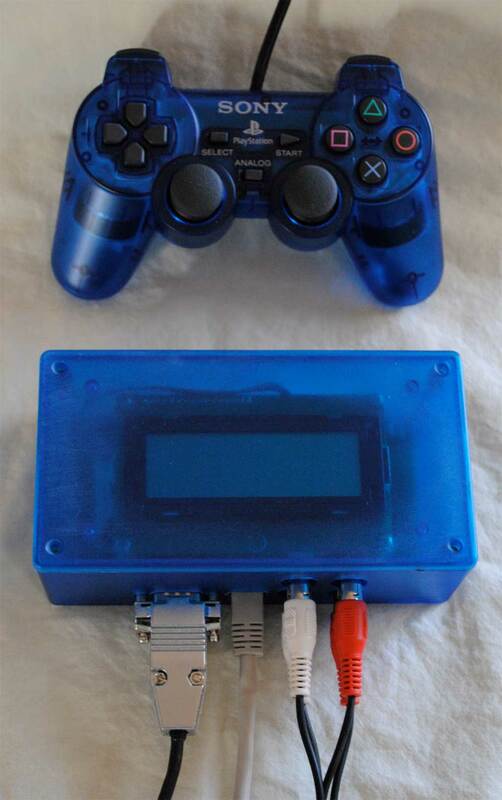 We could make one similar to the electronics enclosure, but with plastic end plates. The machined aluminum parts took a lot of work to make, perhaps plastic could be used to save time/money. 11. 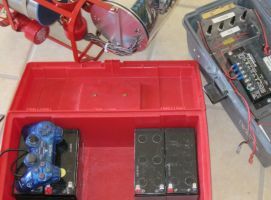 Electronic speed controllers: The speed controllers work very well. The vEx control system seems to have some oddities, and could be replaced with a different type control and communications protocol. Also worked on a design for a new ROV, with a smaller electronics enclosure, less overall size/mass, and a single rear flotation chamber. 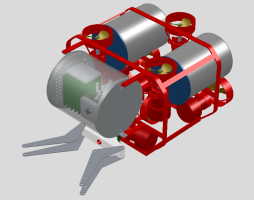 We have two different plans for aiming torpedos in the vertical axis: one uses two widely spaced vertical thrusters to adjust the pitch of the whole ROV, the other has a tilting launch mechanism and uses a more compact ROV design. 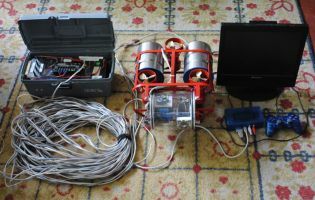 We also discussed what to use to control the ROV. One possibility is a three axis gaming joystick, another is a smaller gamepad. Steve likes the way the Sony PSx controllers work, so we bought a used DualShock 2 controller and took it apart to look at the hardware. 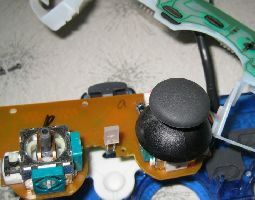 David did some research on the internet and found that this controller has been reverse engineered and documented by several people, and thinks that we could use it as is by modifying our speed controller logic. We also discussed making the speed controller board more modular, with a separate control/power supply unit, and two channel speed controller modules. David will work on this concept, which could also make the design more marketable. The new torpedo parts arrived in the mail, so I went to work making a new torpedo. 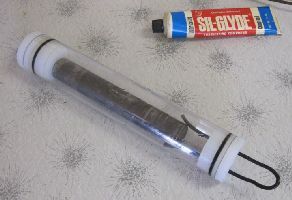 The hull is polycarbonate tube, 35mm OD 1.6mm thick, the ends are made of polyethylene (because it is inexpensive and relatively easy to machine). 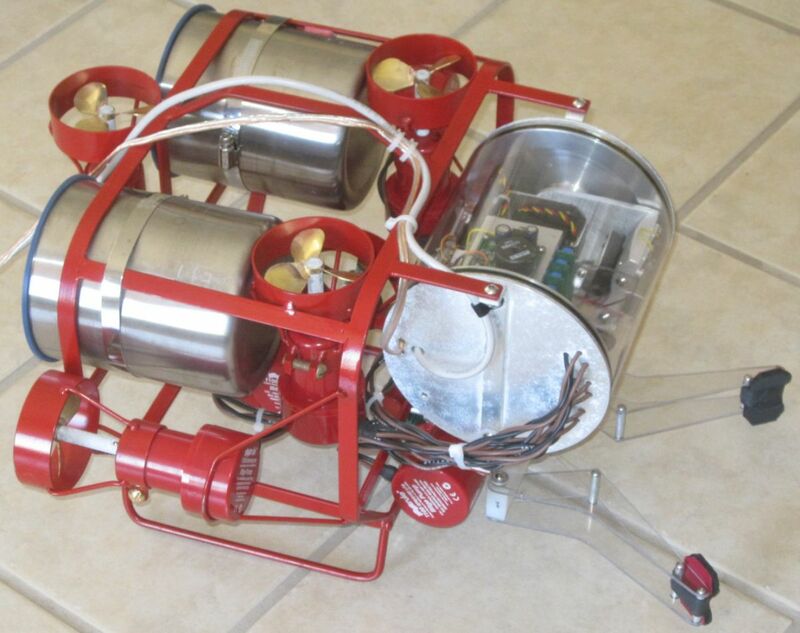 The motor and prop are the same ones I used in the earlier prototype torpedo. 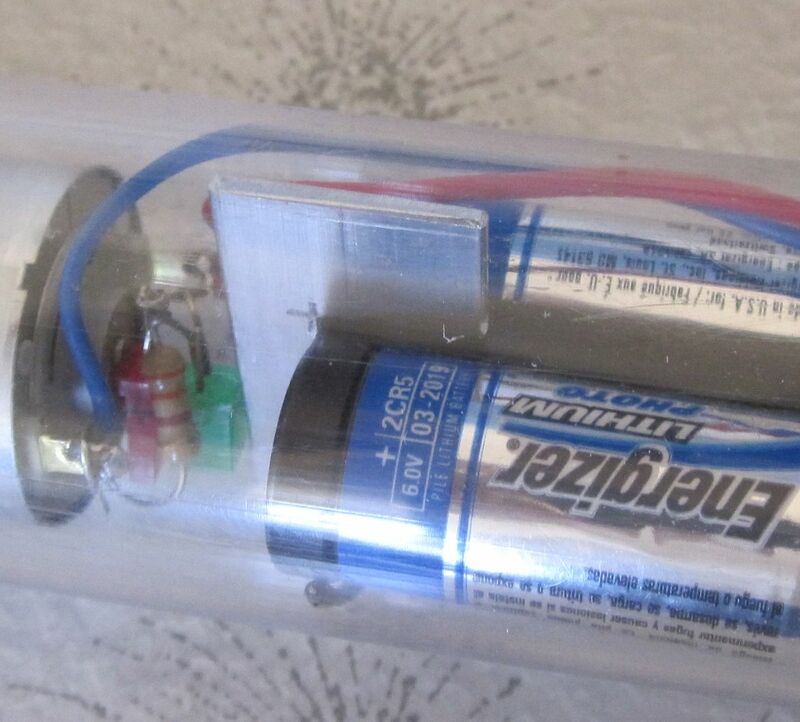 I used smaller batteries because the tube is smaller, and the larger ones won't fit. 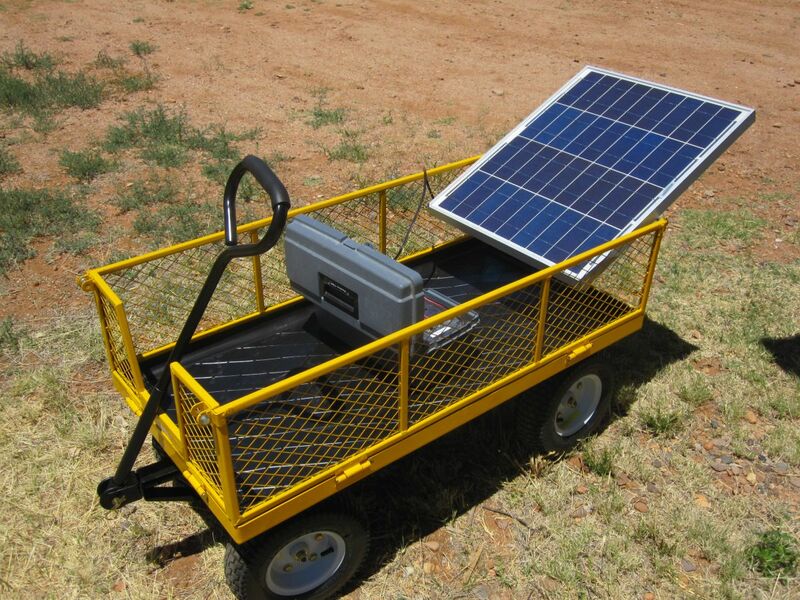 It has eight AAA batteries, I'm using alkaline now, but could change to rechargeable batteries to use renewable power. The batteries are attached to an aluminum "sled" that has a switch mounted to the front. The switch is a push on-push off type, so when the device is whacked at the front, it switches. 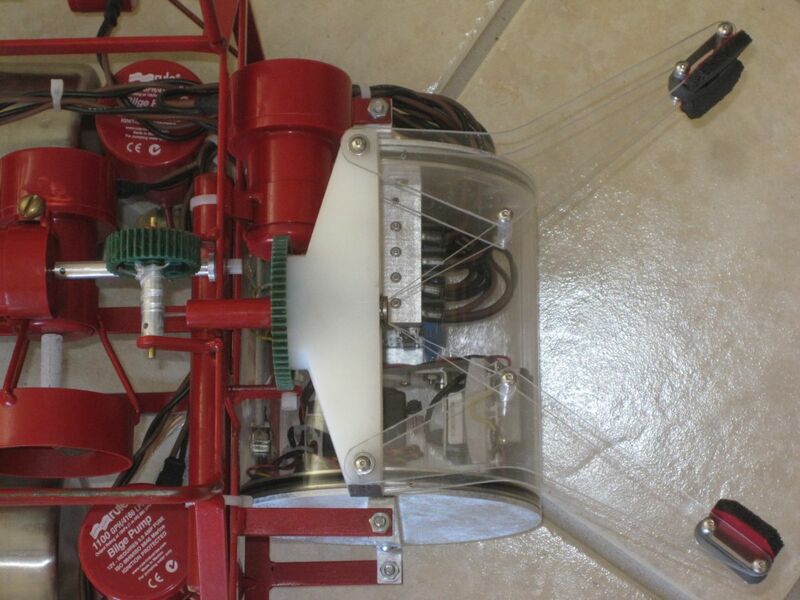 The idea is to turn it on, then launch it, and when it hits the target, it switches off. 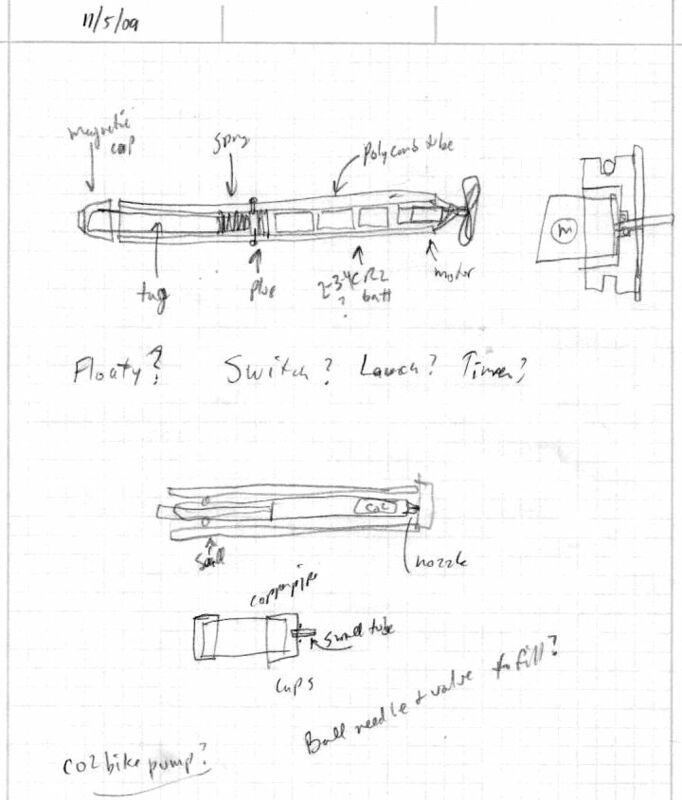 It will need another switch to turn it on when launching it, so the main switch would be more of an arming switch. 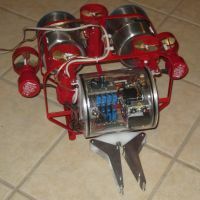 It also probably needs a timer to shut the motor off after about five seconds, in case it misses the target, as it is hard to catch. I tested the torpedo in the pool, it seems to work. It travels mostly straight, and it does shut off when it hits the pool wall at a right angle. I have not figured out a good way to hold the radio tag, or to detach the torpedo from it. I have a lot of ideas, but it needs more thought. 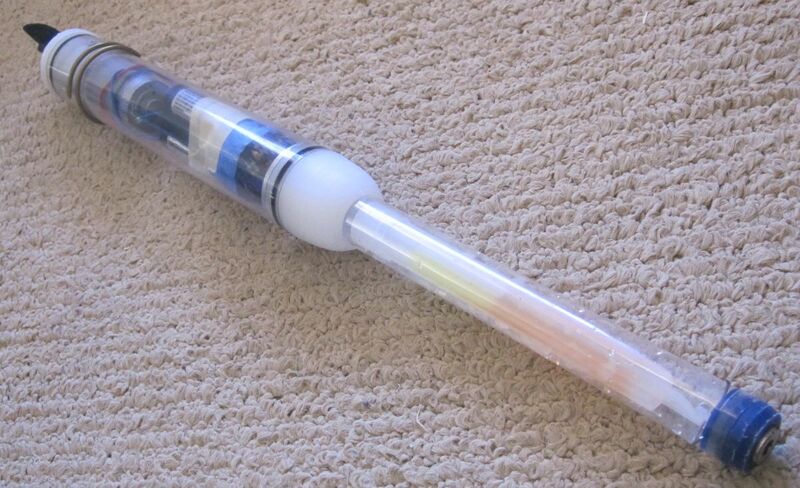 The PVC tube/spring idea does not seem to work very well. 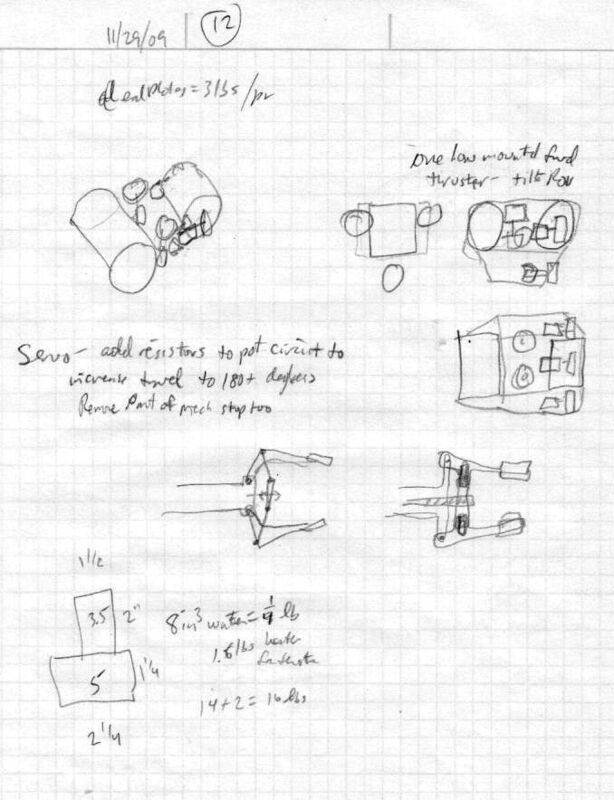 Also, more design ideas....from the engineering notebook. I have a new notebook to put them in, too. 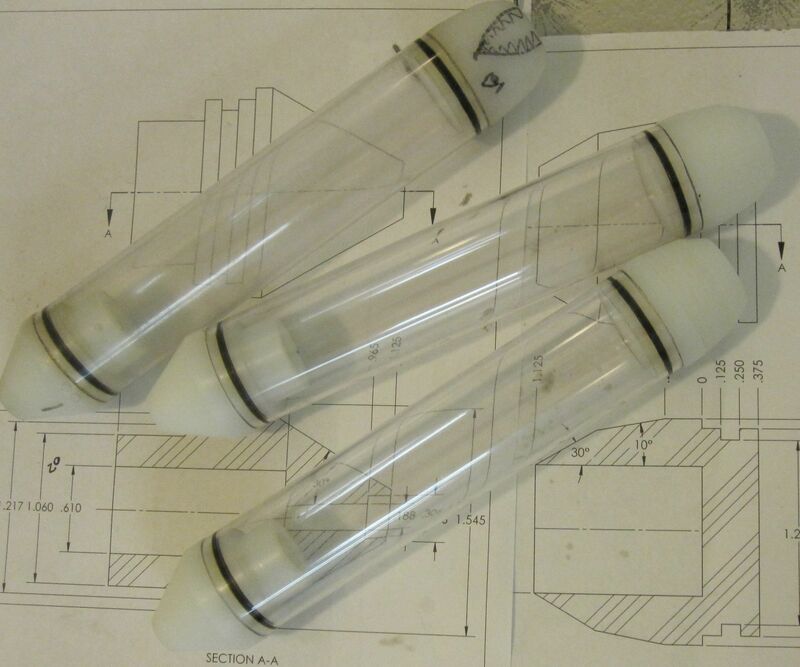 Worked more on the electric torpedo, and ordered some parts to make a more "production" version (thicker, smaller diamter tubing, and large plastic rod for the end plugs). 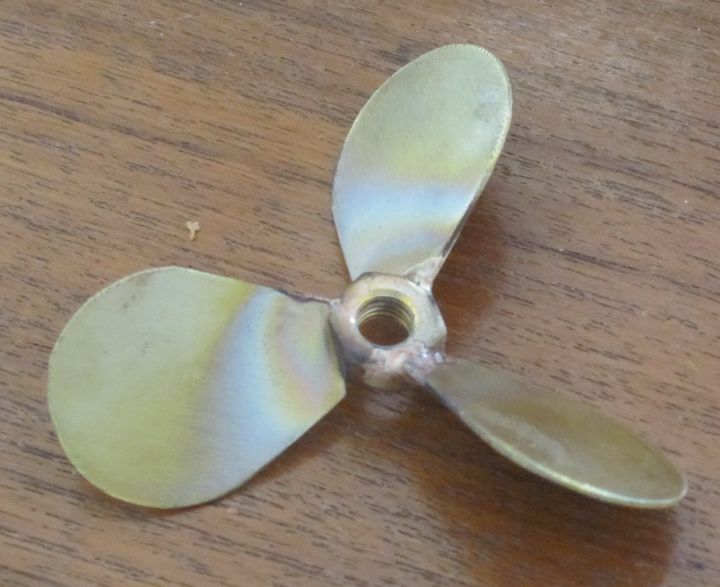 I got it done enough to test using parts I already had, and putit in the pool...it took off like a torpedo and ricoched around until it unscrewed it's propeller! then it was easy to catch. I guess we need to work on the "OFF" switch. I worked on the electric torpedo some more, although all I did was make the end plug that holds the motor in the tube. I also added a bit of info to the requirements document, and asked a question on the Q&A. 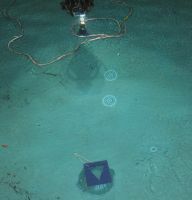 And I got Kevin and Katie to help test out last year's ROV notBob, in the neighbors' pool, just to make sure he still works. I had to do some slight rewiring to the battery box because David used it at Burning Man to run SatanVision. 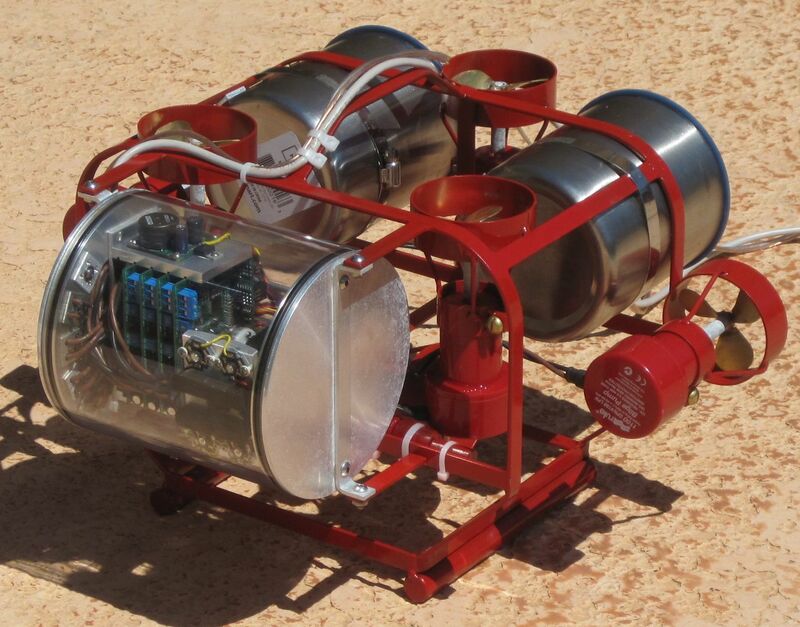 I played with a nozzle type compressed air torpedo, but the results were not very promising. The torpedo is rather heavy to make up for the large amount of air it has, which is needed to make it go very far, and it still doesn't go very far. 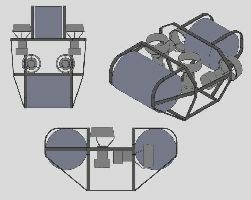 The design could be refined, and possibly made to work, but for now I think we'll play with electric torpedos instead. 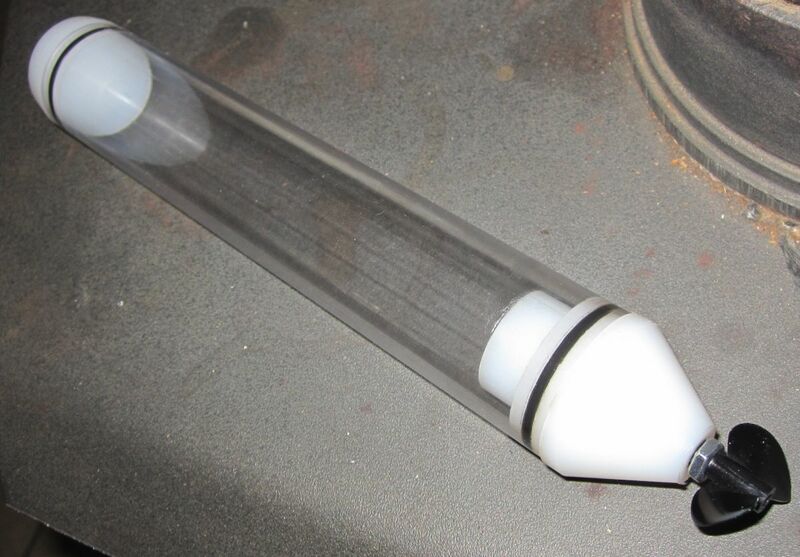 I purchased a polycarbonate tube that is designed for protecting long flourescent lights, I might use it to build a prototype. 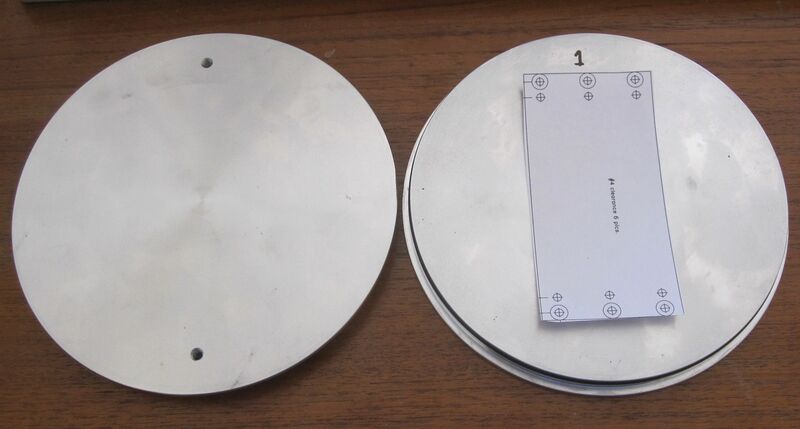 it's about 35mm diameter, half a mm thick. I also have an Attwood small bilge pump motor that I took apart, it could be adapted to use in the torpedo pretty easily, and it includes a reasonably good shaft seal. I also got some battery holders, two each of the 4 cell AAA and AA sizes. The AAA size is about the same outside diameter as the motor itself, the AA is a big bigger, and does fit in the tube I got. Janet did the preliminary work on figuring out the requirements. I added a few notes, but need to expand on the robot functionality column on the right. The game Nessie Quest has some new challenges. One is tagging Nessie with an untethered device, which seems to imply a torpedo. 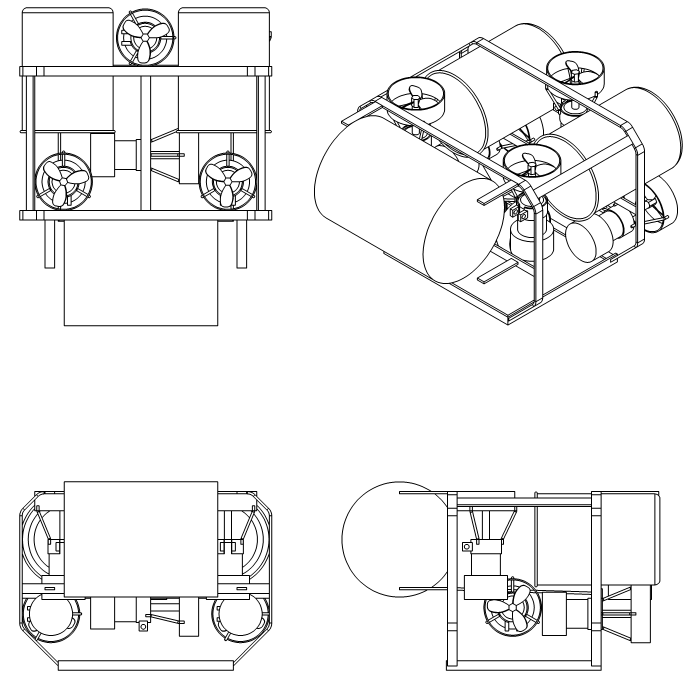 We've been discussing various ways to make torpedoes, the three that we are considering now include an electric motor propellor driven batttery powered, vane pnuematic motor air powered, and nozzle CO2 powered. 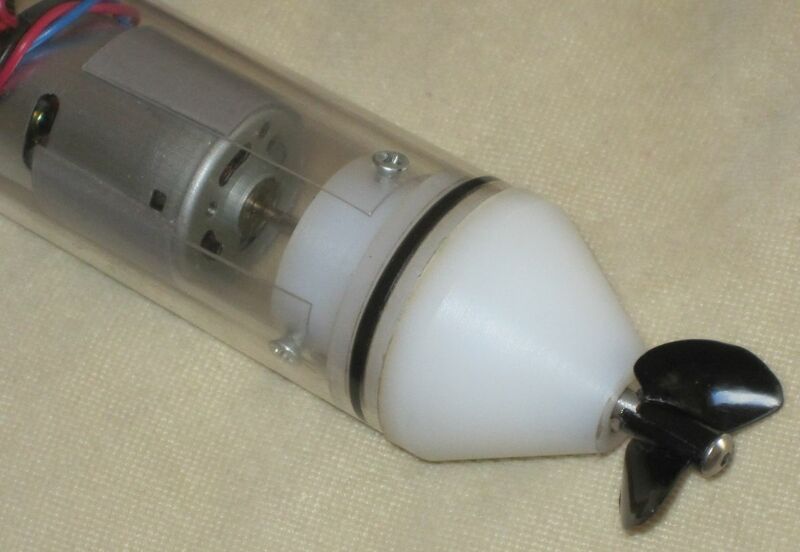 The first experiment with a torpedo is the air motor powered. 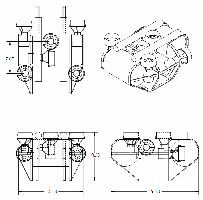 Air tools use vane pneumatic motors, which turn at high speeds, but also have significant torque at stall. Pneumatic devices underwater have some advantage and some disadvantages...water leaks are not a problem if the air pressure is high, but they spew lots of bubbles. To see if this would be a reasonable way to power a torpedo, I adapted a 50mm brass propeller to a 6mm collet air die grinder. 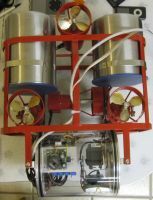 I put the assembly under water and connected air pressure to it. 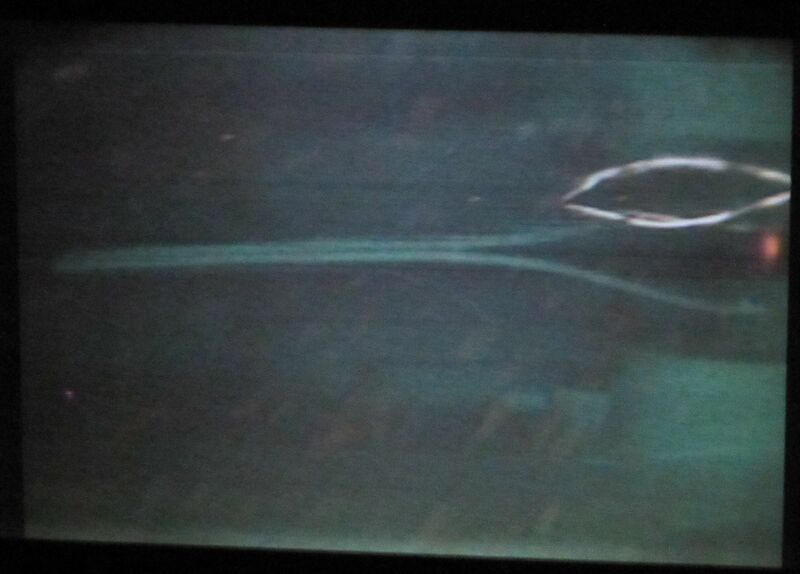 It spun the prop very fast, causing cavitation. I added a pressure regulator, and adjusting it to 25 psi (? ?KPa) seems to give good results, with good thrust and no cavitation. Next I tried an air tank connected to the grinder. 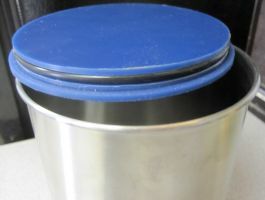 I had a leftover ABS sewer pipe flotation tank and used some brass fittings to connect it to the grinder, not in line as would be done with a proper torpedo, but with the tank over the grinder. It happened to be bouyant enough to float, so it acts like a boat. 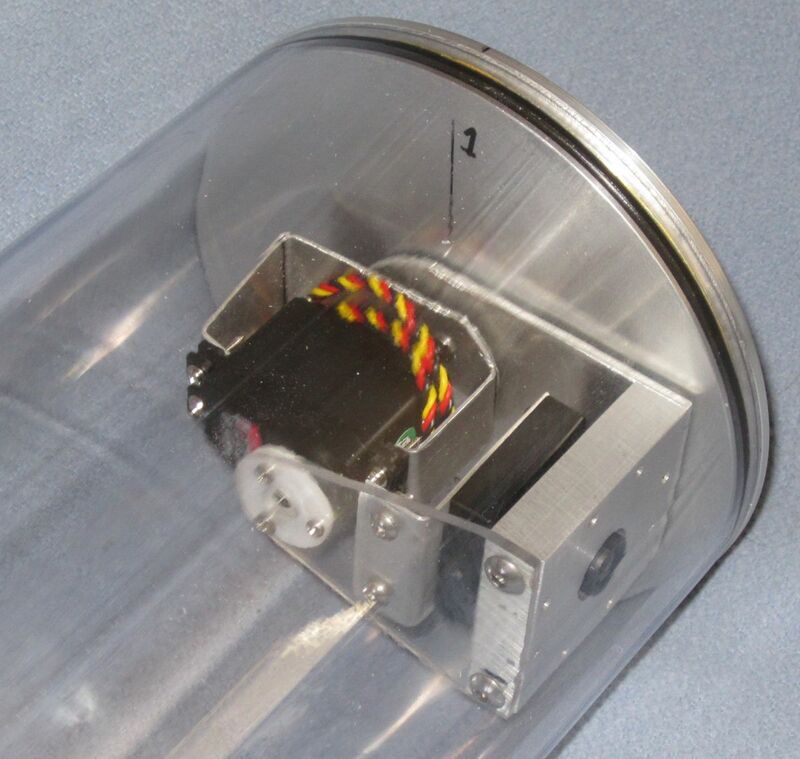 The test is just to see if the air held in the tank is sufficient to drive the assembly through water. It seems to work. 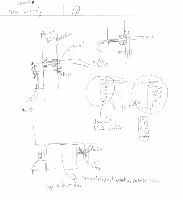 Other things we've been thinking about include control systems, robot degrees of freedom of movement, and manipulation considerations. Some sketches of our various thoughts are below. The wrench for bait activation would allow us to use a simple grabber like that on notBob to be able to rotate the square on the bait container. 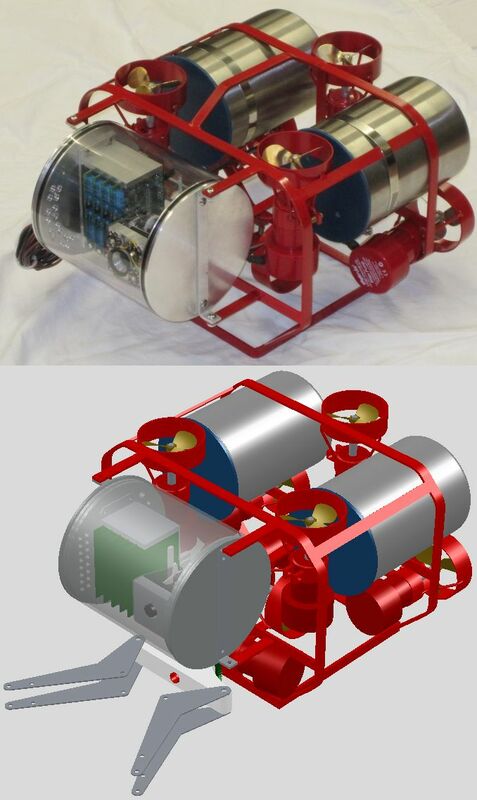 The dual vertical thrusters, with trim difference adjustment, would allow both faster vertical movement, and aiming the torpedo tube up and down as needed to hit the target. The spring loaded torpedo would stick the magnet equipped radio tag to Nessie, then bounce away and hopefully not pull off the tag.